If you thought there was something “fishy” about CERN Showers, then you were right. Indeed, it’s not a new service, just an April Fools’ joke from the Indico Team! It seems like we’ve managed to fool many of you! Throughout the day, we got all kinds of reactions to the announcement of CERN Showers: those who believed in it, those who were in doubt as well as those who understood it was a joke and even decided to play along! Some called it a “well-crafted” April Fools’ joke, others thought that it seemed too “intricate”, so it had to be true. We also know there are people who didn't find it funny at all. Whatever your opinion is, we are happy that CERN Showers landed just on the border between plausibility and the absurd. 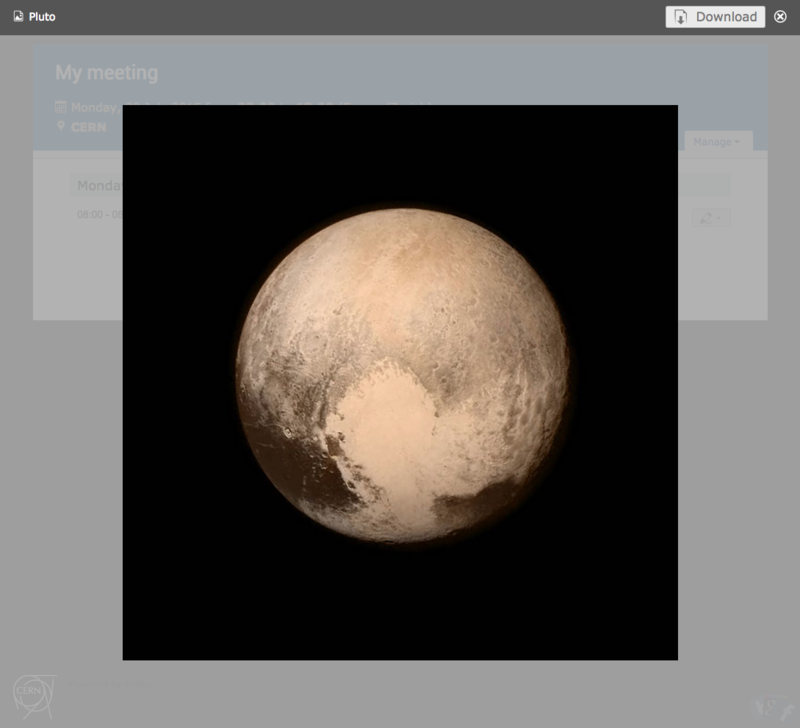 You will be able to use this UI to book meeting rooms very soon, when Indico 2.2 comes out! This is SOOOO great ! With the recurring booking feature, I’ll never forget a monthly shower anymore ! IR-ECO-CO team building event including foam party etc. Test of my new dinghy boat. Catastrophic flooding expected. Not allowed to wash walrus in office. No showers 🚿 were harmed in the making of this joke. Do you need a refreshing odour-killing shower right now? Are you worried that you will arrive at the dressing room and find all shower compartments taken, having to awkwardly wait while your co-workers walk around in undergarments? A scientific study from the University of Los Angeles has found out that there is a strong inverse correlation between shower waiting time and employee happiness. In some of the studies that were conducted, an improvement of 400% in productivity was verified once a portable shower compartment was placed in the test subject’s office. In another case, a 30 year-old male employee decided that waiting in line while his co-workers shower was just too absurd and quit the study. As Indico 2.2, which will include a brand new Room Booking interface, approaches its release date, we have decided its technology is now ready for some battle-testing. So, we got the whole team together for an afternoon hackathon at the dressing room in bldg. 28 and came up with a new Open Source Indico plugin that implements a full-fledged Shower Booking System based on the new Room Booking module. This is the same strategy we’ve chosen to implement the new version of the Burotel desk booking system. The CERN Showers service is the result of this team effort. Based on innovative CERN-developed RoomSearchPlusSquaredRoot™️ technology, this innovative platform will allow you to carefully schedule your personal hygiene thus increasing your productivity and overall happiness. Book your refreshing shower now! 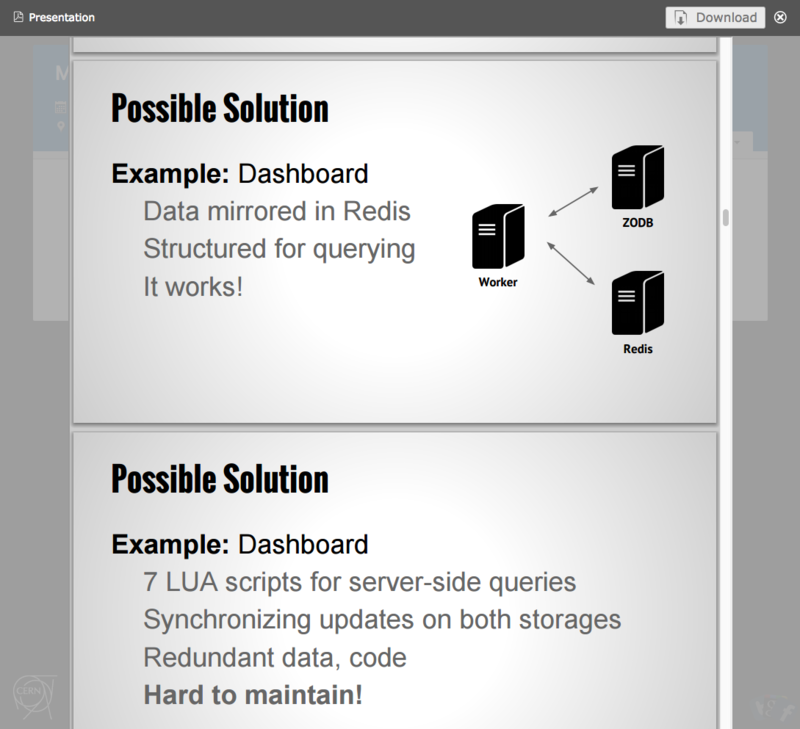 The service’s infrastructure is based on CERN’s own PaaS hosting service, based on OpenShift. In order to cope with demand during high attendance hours, an autoscaling solution was put in place, which will increase the service’s capacity whenever needed. In a coming version, we expect to be able to use giant 3D printers to dynamically deploy (physical) shower containers at the Globe’s parking lot. We’d like to give you a tour of the upcoming Indico 2.1. 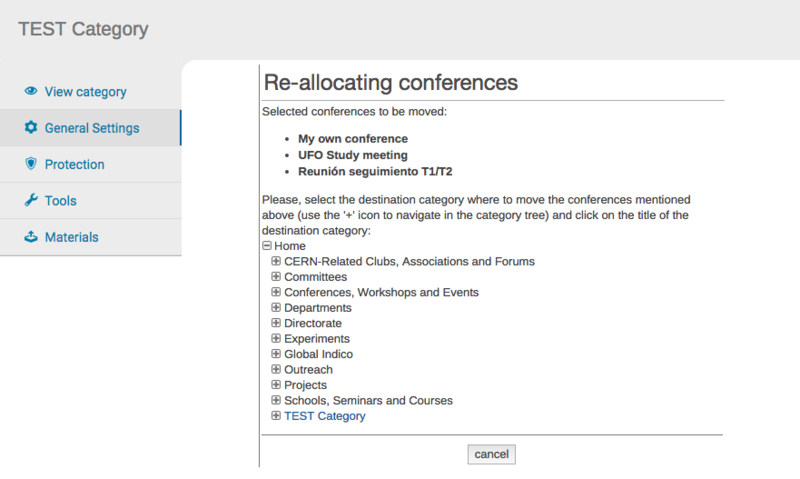 If you use Indico mainly to organize large conferences, we’re sure that you will particularly appreciate this release. Conferences often involve dozens of organizers with very different roles. It’s extremely important to make sure who does what and who is supposed to have access to different parts of an event. We would like to have an Indico where you can define exactly what each of the organizers will be able to do and do so to a reasonable level of details. 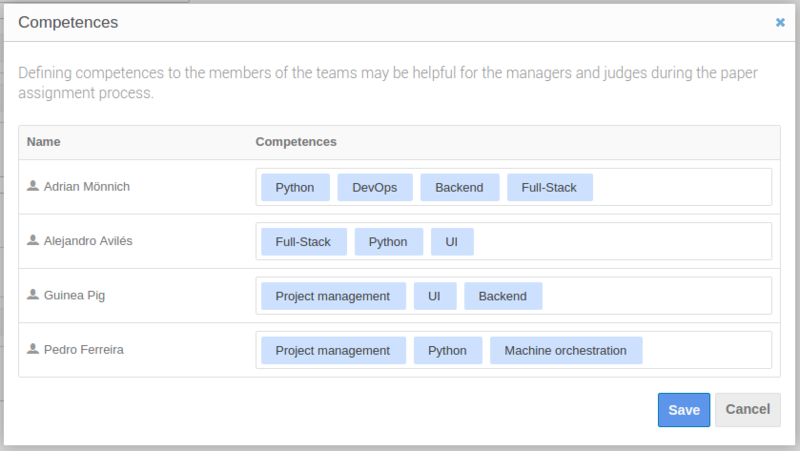 This is why we are introducing a new role system and allowing fine-grained permissions to be assigned to roles, groups and users. For now, you will find that the permissions we’re including are not yet as fine grained as they should, but we will be gradually adding new options over the next few releases. Still, you will find that the “Protection” dialog will look a bit different. We’ve merged the manager, access control and submitter lists into a single one which offers you and immediate view over everyone who can access your event in any way. 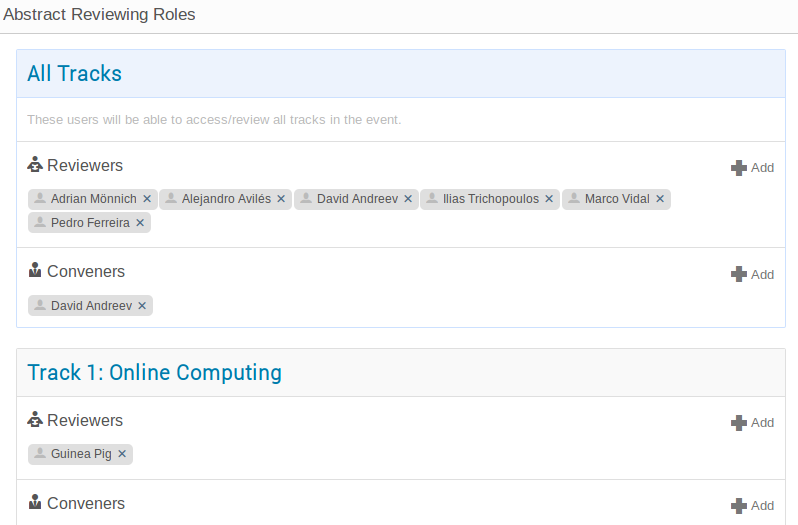 The old “Roles” page has been renamed Participant Roles. Like before, it will list all persons who are somehow involved with the conference (e.g. as chairs, speakers or playing any other particular role) and now also their respective “custom” roles (as defined by you). A new page, called Role Settings will actually list all the roles that exist in the conference and allow you to add, delete or modify existing roles. One of the shortcomings of the abstract and paper reviewing modules has always been the fact that they’re limited to rating based on a scale. That is not the case anymore. From now on, you’ll be able to have yes/no and free text questions. One particular kind of request we often get comes from organizers who have registered their participants through a 3rd party system (sometimes belonging to a PCO - Professional Conference Organizer) and who would like to import their data into Indico. In order to help users in that situation, we have introduced a new Import from CSV feature for event registrations. This feature currently only supports basic form fields (name, affiliation, position, phone number and e-mail) but we intend to extend it to to other field types in the future. We have also implemented a mechanism that enables an organizer to import contributions, also from a CSV file, including time information. We hope you will like this release. As usual, feel free to contact us if you have any comments/suggestions! One year ago we decided to disable our help documentation, since it was not up to date with the current status of the tool. The decision was taken based on the fact that Indico was going through a complete overhaul of its back-end, which implied significant interface changes every two or three months. It wasn't just worth rewriting the documentation every time. At the beginning of this year, we started working on a new help site. We were lucky to count on the expertise of Maria Dimou, who invested a lot of time reframing a few parts so that they'd become more user-oriented and actually rewriting from scratch most of the rest, so that it would fit the "new" Indico. The result is now accessible and can be consulted through the "Help" link at the bottom of every Indico page. We do have an additional surprise for our users, though: this new documentation is enriched with walkthrough videos that will explain you how to perform Indico's most used actions step by step. This is once again thanks to Maria's work, together with Alex Manzoni, a University of Geneva Master's student in Learning Technologies, who lent us his expertise (and his voice!) Many thanks to both of them for this great piece of work! We hope that this new documentation will be useful to you. As usual, don't hesitate to let us know if you have any suggestions! We will also make available, until the end of the month, a page explaining in detail the Room Booking process as well as the configuration options available to room owners. Indico keeps moving forward! The main focus of this release was the complete re-engineering of our Paper Reviewing module. The following list summarizes the new features and improvements that are included in the 1.9.10 release, one step before the long-awaited 2.0 release. 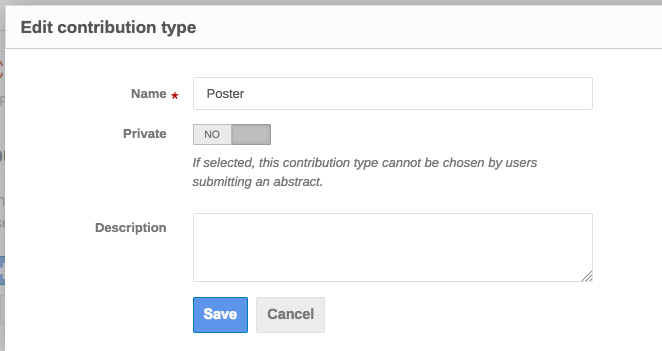 Another entry point for submitting a paper for a contribution is the contribution page itself. The paper submission form has also been simplified. 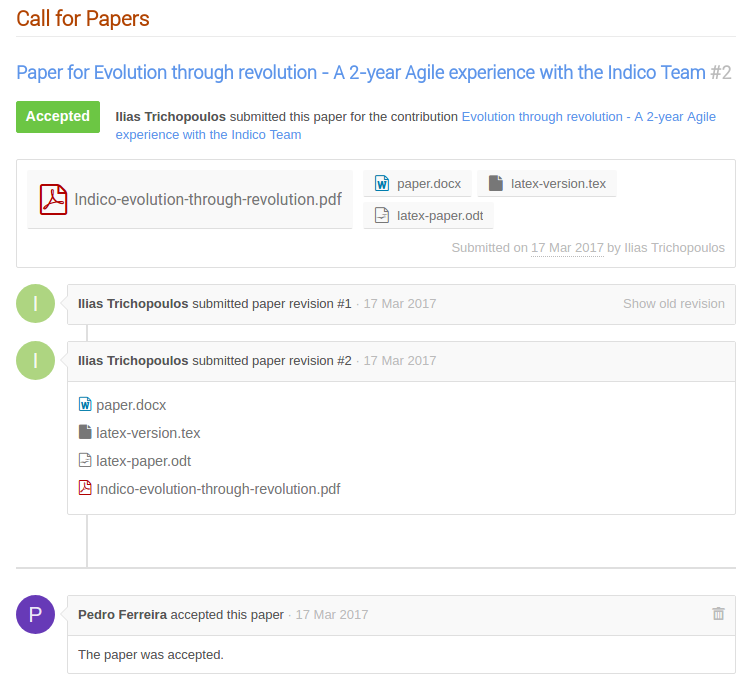 Once the user submits their paper, it is marked as Submitted, the corresponding managers and reviewers are notified and the reviewing process begins. A new feature that we are very proud to announce is the paper timeline page. Submitters, reviewers, judges and managers can all access this page and be informed of the current status of the paper. Moreover, this page provides a timeline indicating all the steps that the paper went through until it reaches its final stage. 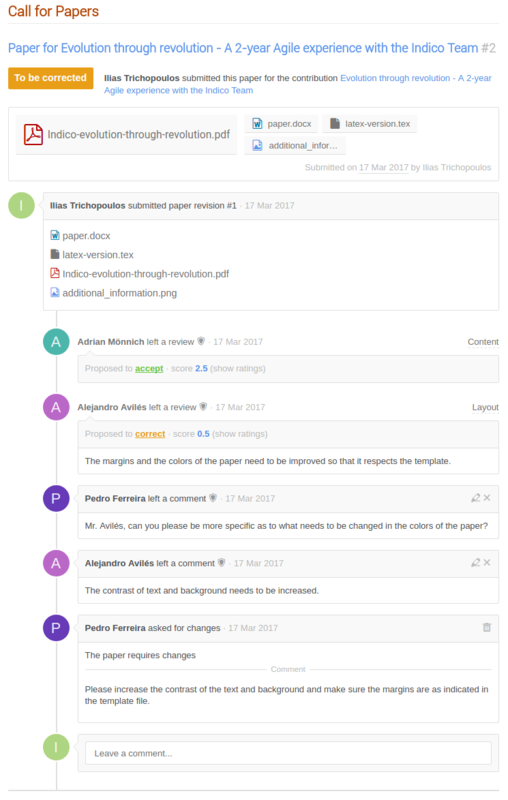 Last but not least, this page also serves as a communication hub between submitters-judges and reviewers-judges by allowing comments for every paper revision submitted. 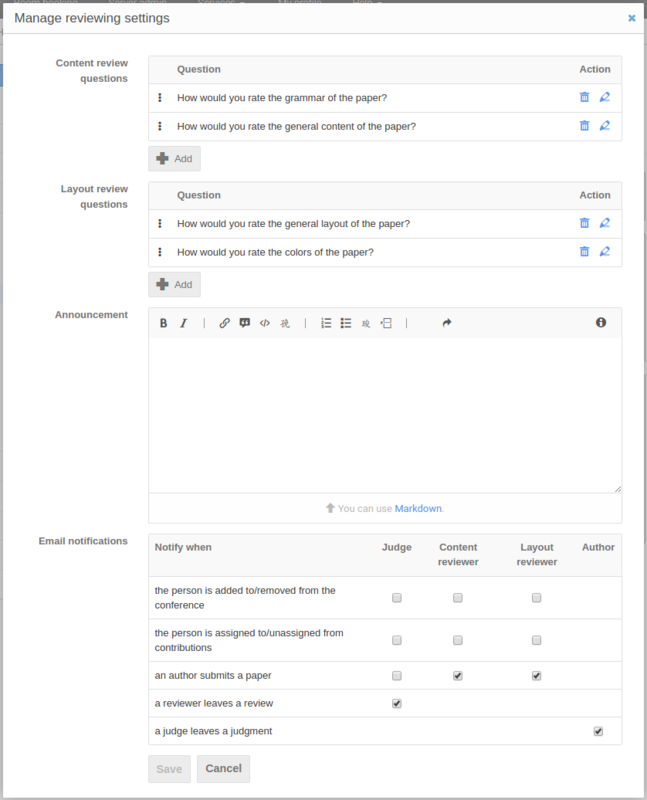 Users can submit new revisions of their paper, reviewers can submit their reviews and comments and the judges can easily make a decision by having all the necessary information in one page. In the Reviewing Area of the conference, the reviewers can have a general overview of the papers that need to be reviewed and the reviewed ones. Similarly to the Reviewing Area, the Judging Area of the conference provides an overview of the submitted papers to the judges. 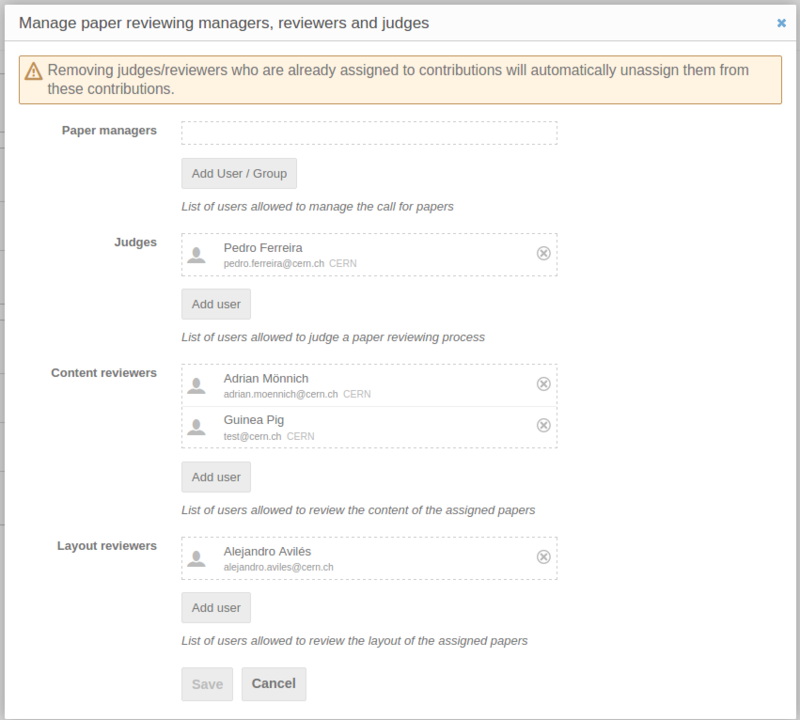 It lists the papers that the judge is assigned to, allowing them to make a decision but also to assign/unassign content and layout reviewers. Major changes also affected the management area of the paper reviewing feature. 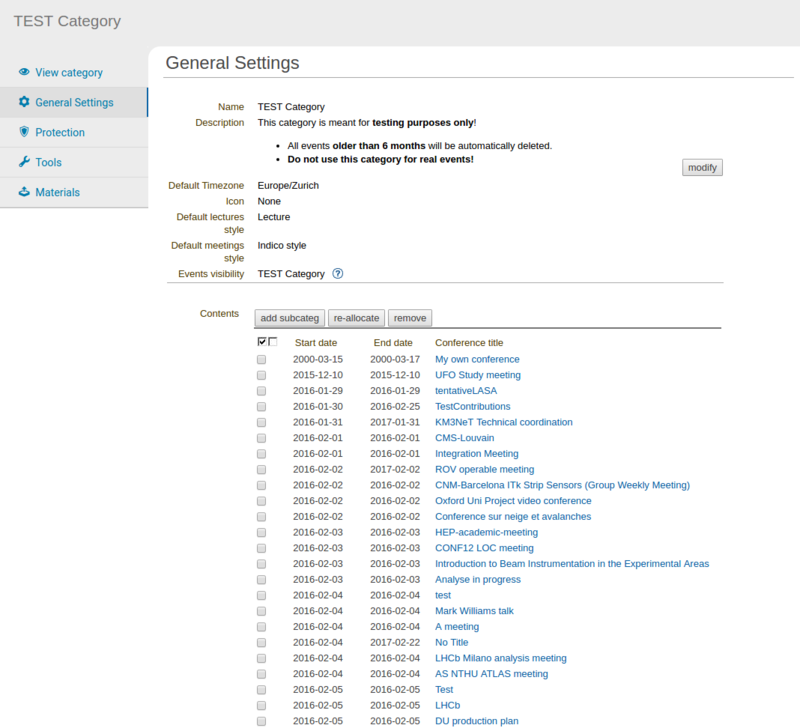 In the dashboard page of the Call for Papers, the manager can find available options and configuration settings, all grouped in a way to reduce complexity and improve discoverability. These include the activation of reviewing types (content, layout) and configuration of deadlines, the management of the paper templates, the configuration of the reviewing settings and teams and other necessary options. In the reviewing settings dialog, one can manage the reviewing questions of each reviewing type, the announcement of the Call for Papers but also the email notification settings. 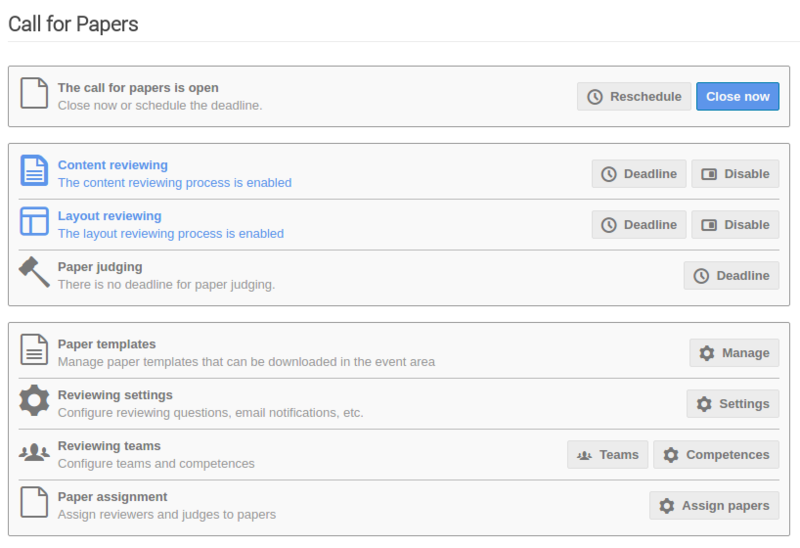 Apart from the Judging Area in the display area of the conference, managers can also assign papers to the corresponding reviewers and judges through the paper assignment page. Yet another eye-candy is the new HTML layout of the emails sent through Indico related to the paper reviewing process. 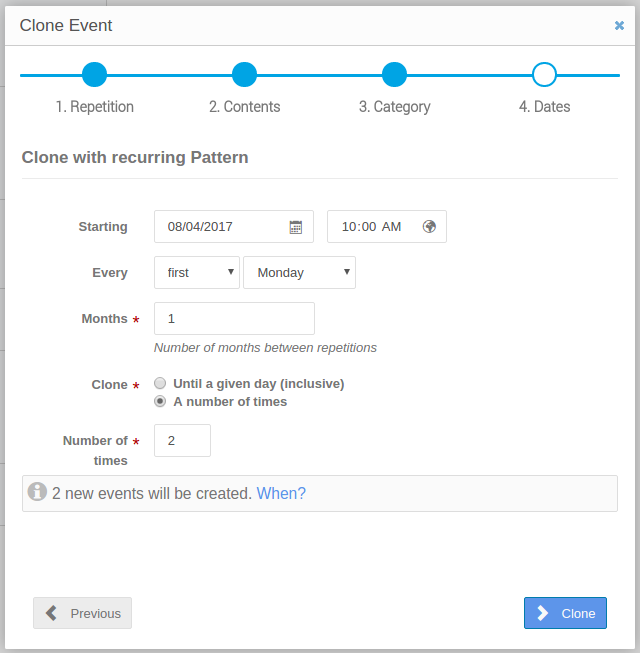 The complex interface for cloning an event has now been simplified with our new step-by-step guide. That’s all for now! We hope you will like the changes this release introduces and of course, we are looking forward to your feedback! After many years supporting both plain HTTP and HTTPS, we will be pulling the plug on unencrypted access to indico.cern.ch. The change should be transparent to all users. Services using the Indico HTTP API should switch to an HTTPS URL (should already be the case in most of them) or at least make sure their client code is correctly handling redirects. The following list summarizes the new features and improvements included in the Indico 1.9.9 release. Improvements were done mostly regarding the abstract submission and abstract reviewing workflow. 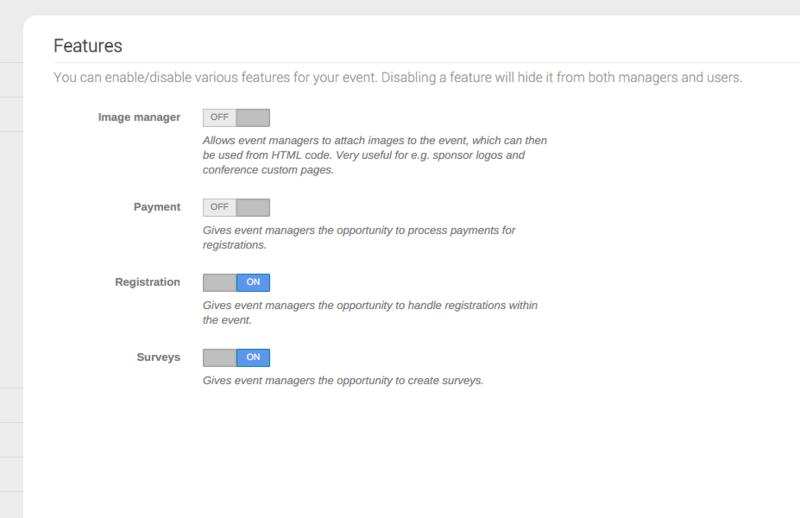 The new interface provides users with more intuitive features and give more flexibility to event managers. 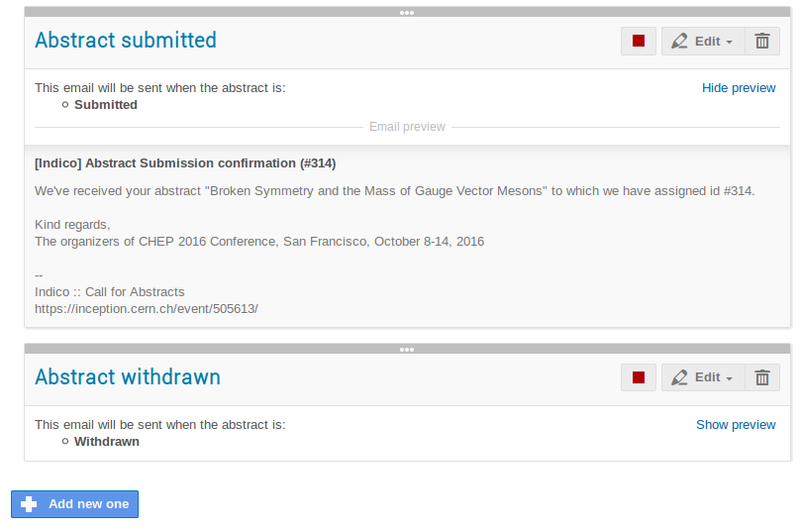 It is now possible to send email notification also when an abstract was submitted or withdrawn. There is also the possibility to choose from different email templates that can be used as a base for the email notification. Reviewers provide an assessment of the abstract. They can consult only their own reviews. Conveners can read all reviews in their tracks. 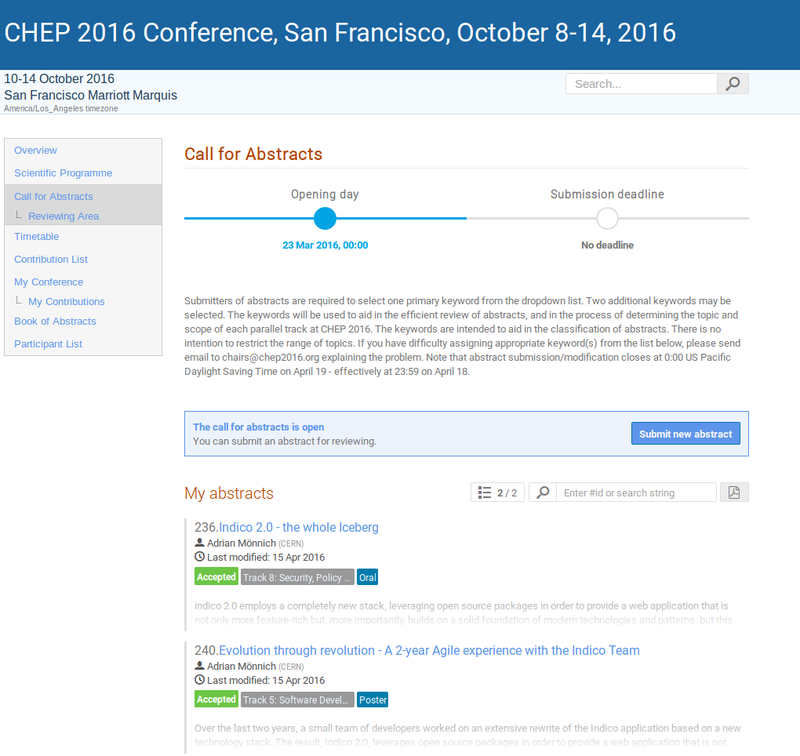 If the event has been configured accordingly, they can also accept or reject abstracts on behalf of the event organizers/managers. When configuring abstract reviewing questions, one can now add questions whose responses will not be included in the average of all scores of abstract reviews. Very often organizers wish to provide specific instructions that should be read before an abstract is submitted, reviewed or judged. A new feature allows managers to provide a text that will be displayed whenever one of those actions is about to be performed. 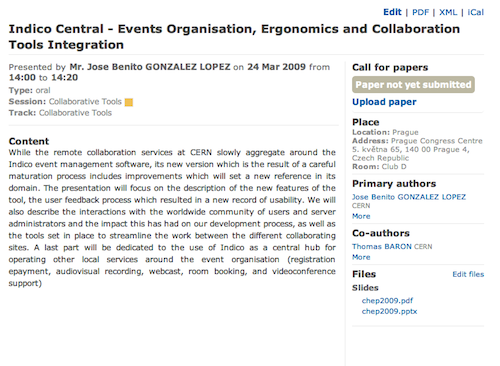 When abstract submission is open, a nicely formatted message is displayed at the overview page of an event, notifying users that they can start submitting their abstracts. 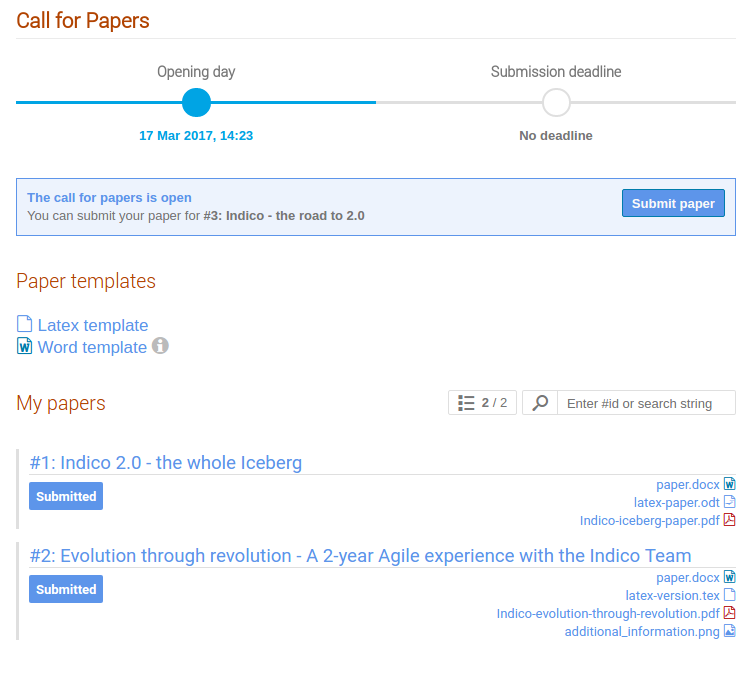 The new integrated “Call for Abstract” page is a place where users can conveniently find all information regarding the abstract submission process, as well as a list of abstracts they’ve authored/submitted. The biggest addition in version 1.9.9 is probably the new visual representation of the abstract reviewing process. The timeline provides an easy overview of the abstract reviews as well as the overall score of the abstract. 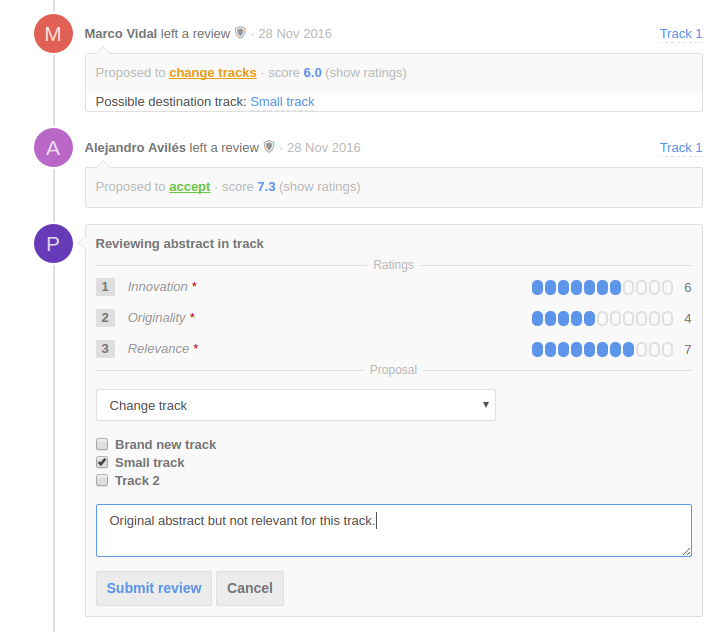 Reviewers can easily add a review stating their opinion whether the abstract should be accepted, rejected, merged, marked as duplicate or moved to another track. For judges (event managers) there is a review summary at the end of the timeline. This provides them with an overview that facilitates the decision process. 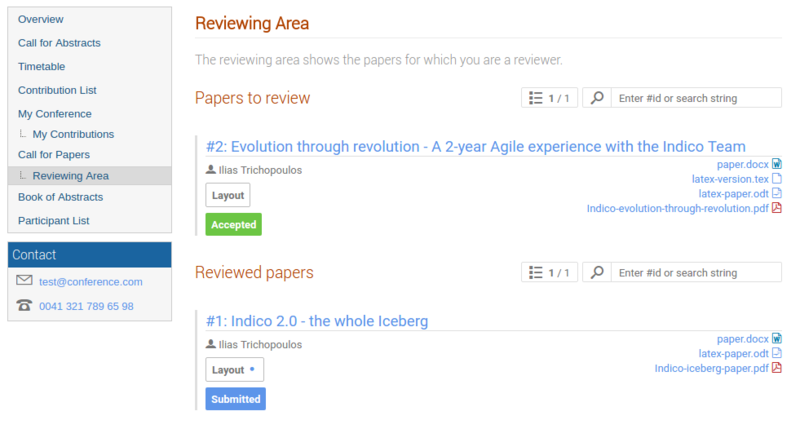 Reviewers and conveners have now access to a new “reviewing area” where they can easily see in what tracks they are reviewers/conveners of, as well as how many abstracts they reviewed or still need to review. Once again, a new version of Indico is released with a lot of user interface improvements especially (but not only) in category-related pages. This brings us one step closer to our Indico v2.0 destination! We are certain that these new changes will improve the way you interact with Indico and we are looking forward to your feedback. Let’s have a look! Categories can now have a logo which is displayed above the contents of the category. 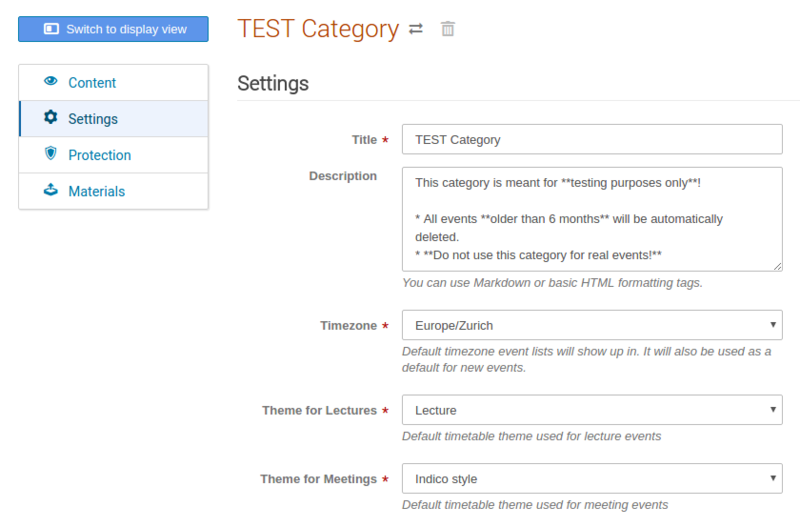 In the process of improving the user experience on the category pages, the events overview page as well as the calendar page are becoming more and more friendly, following our users’ feedback. One of the most frequent actions users perform on Indico is creating new events, as well as selecting a category where the event will be created. Navigation of Indico categories has been redesigned completely, providing a clean, fast and easy way to find a category. 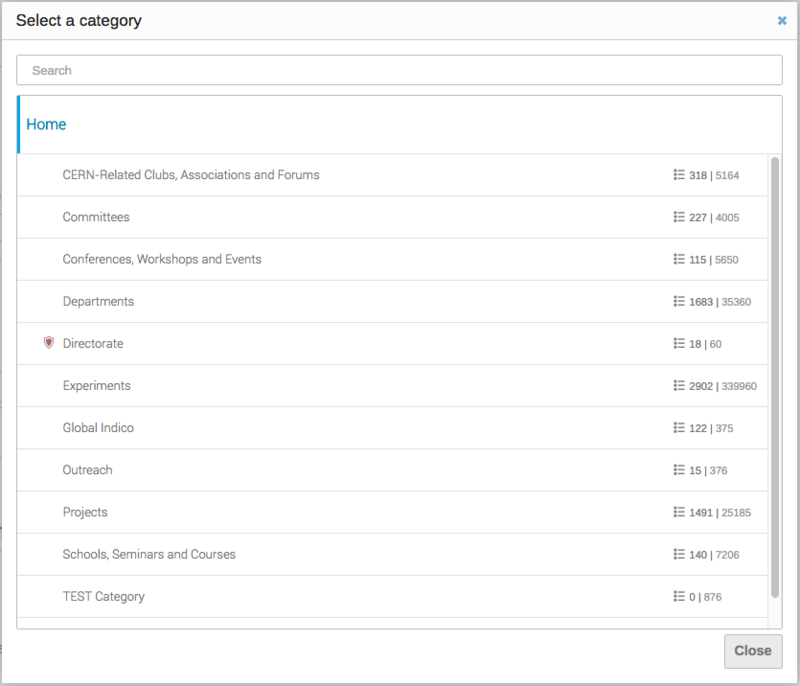 Try out the new search functionality: simply search using the category title and categories that match will show up. Note that your favourite categories will always appear at the top of the list. Several improvements and simplifications took place in the category management area, allowing managers to create, configure, move and delete categories in a more efficient way. 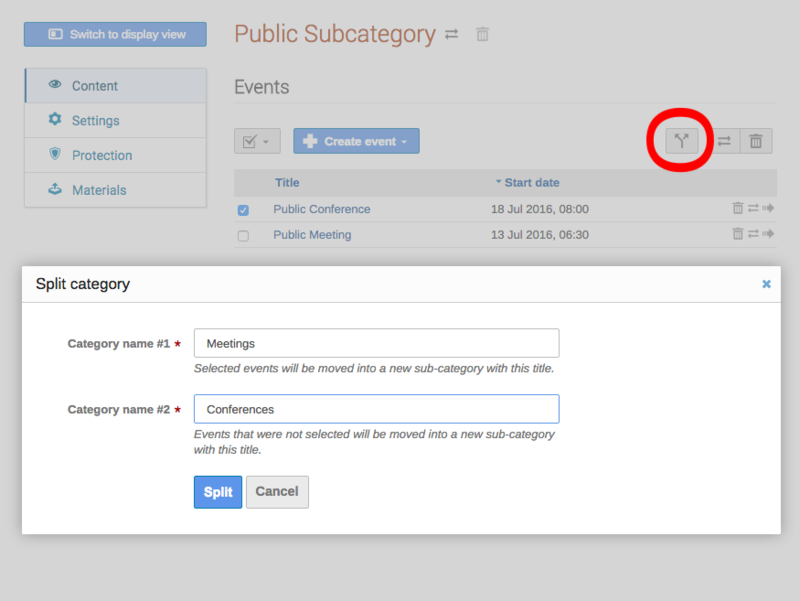 By editing a category the manager enters the management area and specifically the Contents page where the list of subcategories/events is presented. 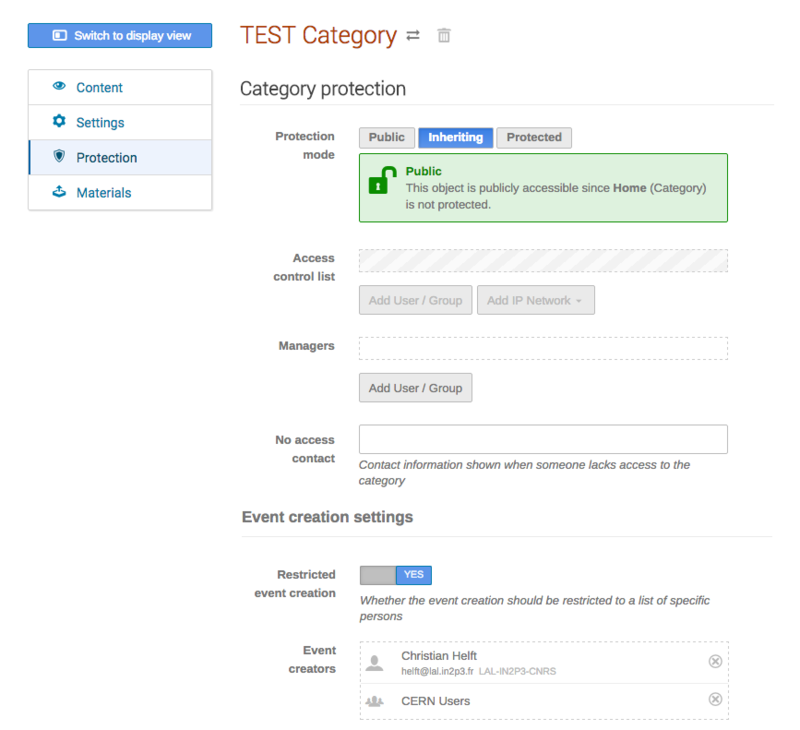 In the same scope, the layout of the Protection page has also been improved, following the new UI standards. A new feature introduced in the Settings page of a category is the one of the custom event headers. This allows the display of a custom info/warning/danger message at the top of every event inside the specific category. The actions of moving and deleting the current category are now always accessible from the icons right next to its title, in all category management pages. This new feature makes the old Tools page obsolete and thus it has been removed. Something that shouldn’t go unmentioned is that users can move their events/categories from one category to another without the requirement of being the manager of the parent category. This means that if the user John Doe is the manager of an event in the category A, he can move it to category B without asking the manager of the category A to do this action for him. A new feature in the category management area is the one of splitting a category into 2 separate categories. More specifically, the manager can select a number of rows from the category’s contents and click on the split button located at the top right corner of the table. This will move the selected categories/events into the first new category and the rest into the second. Our main objective is to always satisfy the needs of our users and keep developing our software based on the feedback we get. The meeting page is one of the most common screens a user faces during their interaction with Indico and we put a lot of effort into polishing its interface and functionalities. A very frequent problem during meetings is that the projectors cannot always display properly all color variations. We are now using darker tones with higher contrast to ensure that the meeting page will be displayed properly, independently of the screen type. The consistent use of bold typefaces improves the readability and discoverability of the important items of the page. Improvements in the visual hierarchy of the timetable entries came along with a better indentation of sub-contributions inside a contribution block. The rendering of the break blocks and the edit buttons is now more discrete in order to retain the focus of the user to the rest of the timetable entries. The clear separation between days helps the user track down the day of interest faster. The attachment icon next to the list of uploaded materials has been removed, since the layout of the materials themselves is enough to distinguish them. A new feature for this release is the option to get a direct link for a timetable block just by clicking next to the block’s title. You can then forward the link to a colleague and the page will open with focus on the selected block. A lot of things have also changed under the hood, as always. Being the focus of this release categories, all the operations related with them are now much faster. 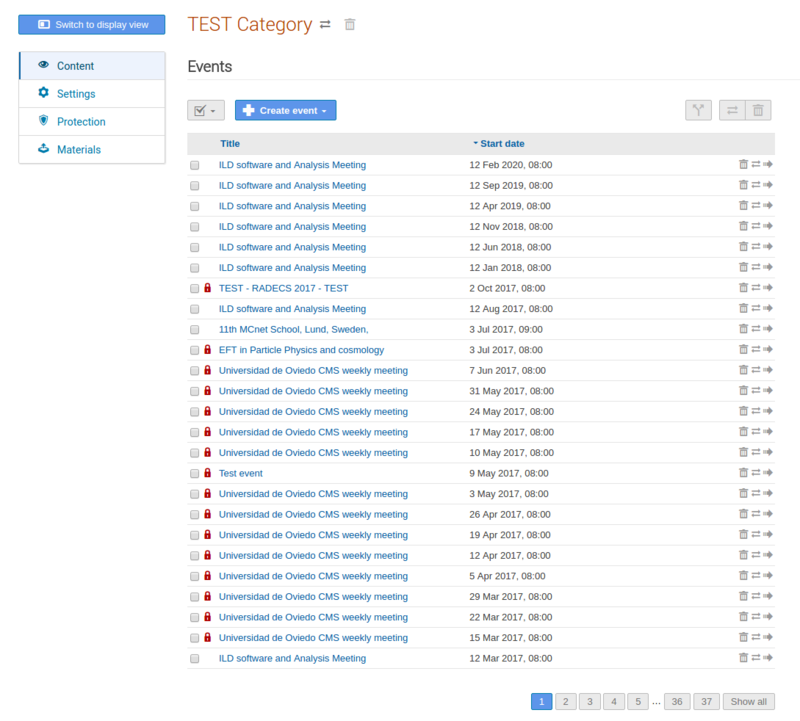 The loading time of category contents in the management area used to be quite slow for categories with many events, since the whole list would be displayed. Now this list is paginated and the loading time will always be small. 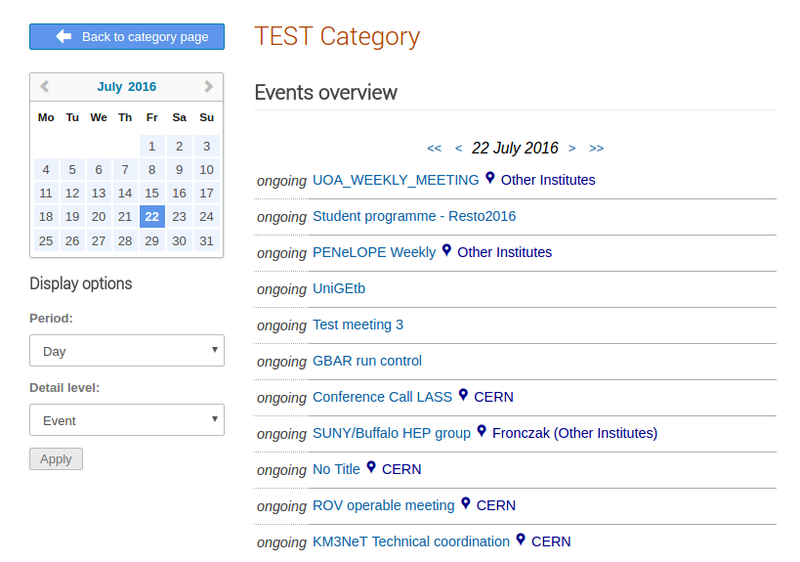 Checking the calendar for big categories used to take ages: up to 1 minute for the Home category in our CERN Indico instance. Now, it’s instant! The month category overview with contribution granularity was also painfully slow for big categories, usually ending in a timeout. It’s still a very expensive operation, but now the server won’t leave you hanging. CERN's Jabber server was created in 2009 in order to fulfil some use cases that other collaborative tools couldn't address. Its close integration with Indico meant that users could conduct their meetings over a chat session, or just complement their videoconferences with textual information. Fast-forward to 2016 and conferencing tools such as Vidyo and Skype provide their own chat systems. Other services (such as Mattermost) have meanwhile been put in place to provide the same kind of functionality we were aiming for at the beginning. They do it in a more user-friendly way than even modern XMPP clients. This is why the Jabber service will be discontinued from the 19th of September 2016 on, in favour of the options above. Indico integration will consequently switched off. You are encouraged to download any logs you want to preserve using the "Logs" button next to your room name ("Chat rooms" section). Thank you for your understanding and hope to see you on Mattermost! We are pleased to announce yet another milestone in the path to Indico 2.0. 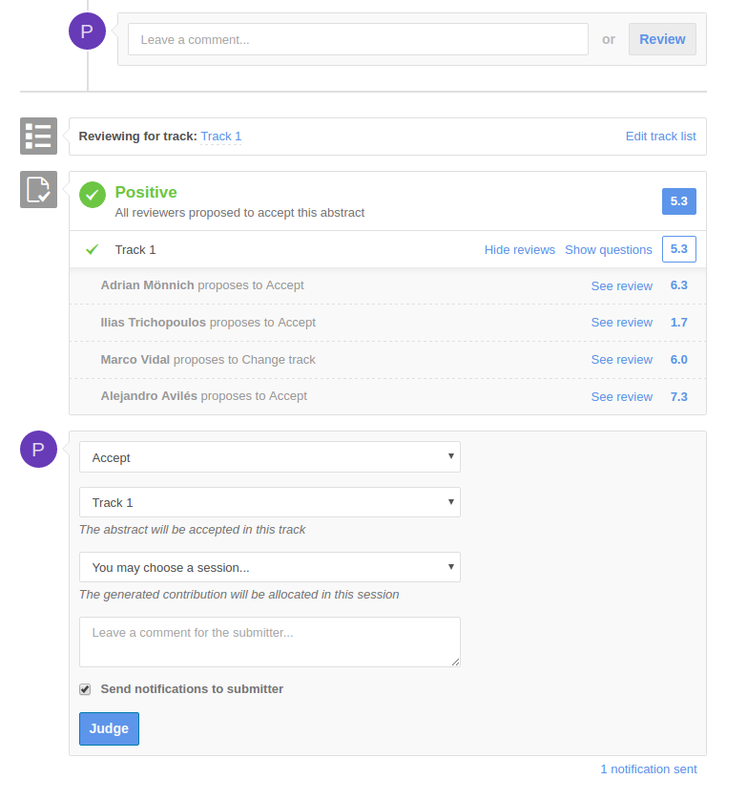 You will find lots of improvements in this version, most of them related to timetable, contribution and session management. 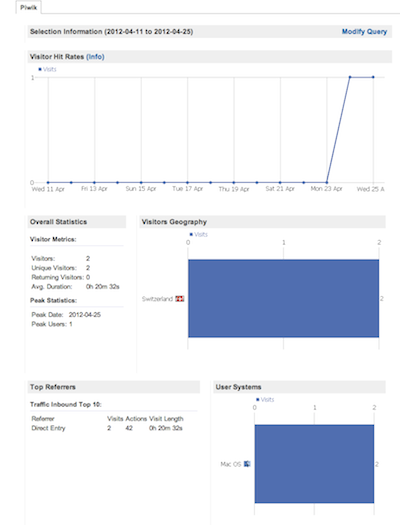 Meeting pages are the ones that receive the most visits. This is why we find it important to make them better version after version, adding new concepts to formulas that are already known to work. This time, we’ve focused on modernizing the look, taking advantage of new technologies and code to bring it to the next level. The most essential pieces of information concerning an event are now clearly isolated and displayed in a way that we hope that will decrease confusion while retaining simplicity. Contribution management can be one of the most tedious tasks in conference organization. It often requires lots of clicks and transitions between pages. With this new release, we’ve tried to simplify this process as much as possible. 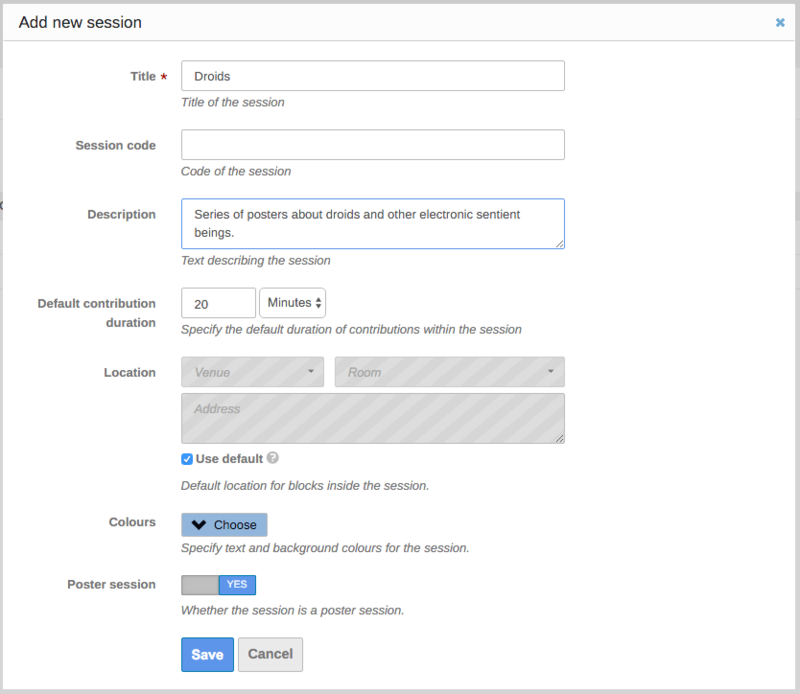 Some of the actions that previously required changing page, such as setting a session or a track for a given contribution, are now within the reach of a click. 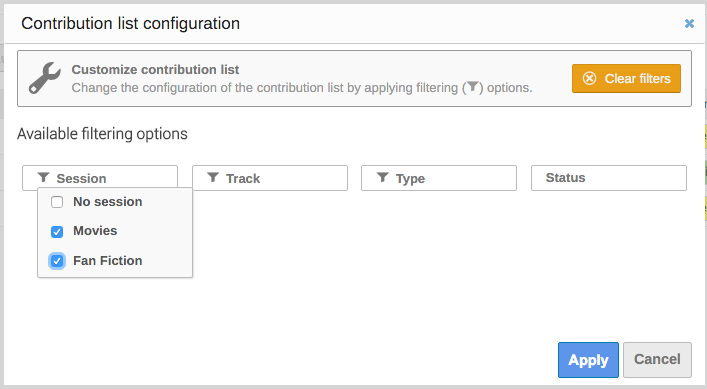 Filtering contributions based on their properties is now much easier, thanks to the user interface pattern that we had already introduced for Registration Forms in the previous release. 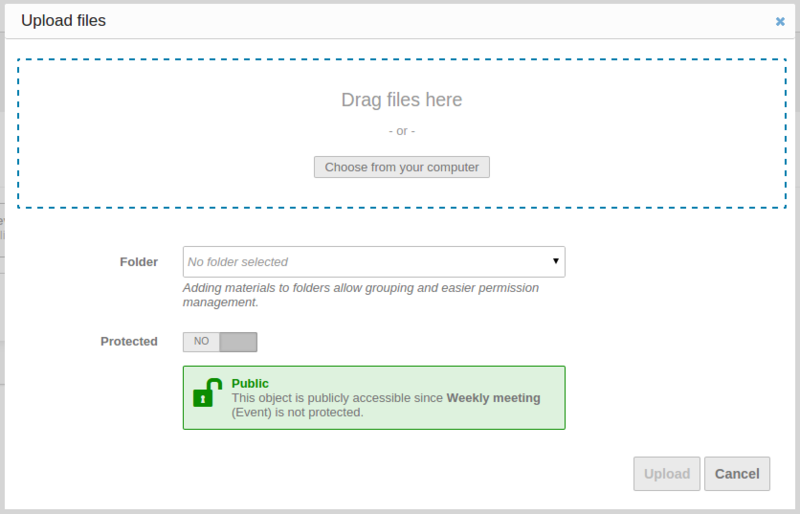 One of the completely new features we have added in this version is an interface fully dedicated to session management. The concept of “session” is central to Indico, yet the only way to manage a session up to now was through the timetable page. We believe things become much simpler when it is possible to have an overview of all existing event structures. Modal dialogs are a very powerful tool when used at the right spots. We’ve tried to concentrate as much of the functionality as possible in the contribution and session lists and the remaining features in simple and easy to access dialogs. We have invested quite a lot of effort in completely reworking some of the most important widgets as to make them as usable as possible. For instance, we’ve added autocomplete to the room selector. Thanks to our new PostgreSQL-based database schema, we’ve managed to considerably improve performance in some of the slowest spots in Indico, such as rendering of large meetings, conference timetables and overview pages such as “Today’s events” and Week’s events. In some cases, we’ve seen as much as 70% decrease in rendering time. The “CDS Agenda” style was introduced in the early days of Indico, in order to keep users of CDS Agenda comfortable during their transition to Indico. Ten years later, we have decided to discontinue it, as it is used by a very low number of recent events and offers no advantages over the “standard” Indico theme. 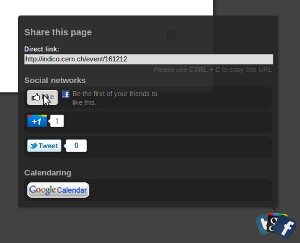 We now display a link to the original event in every clone, as well as links from the original event to its copies. You will find this information in the management page, within the event header. New “Export to XSLX” option - when CSV is not good enough (and Excel can be pretty picky sometimes! ), we now offer direct export to XSLX format. We believe that’s it! We hope you will like this release and, as usual, we would like to know your feedback! 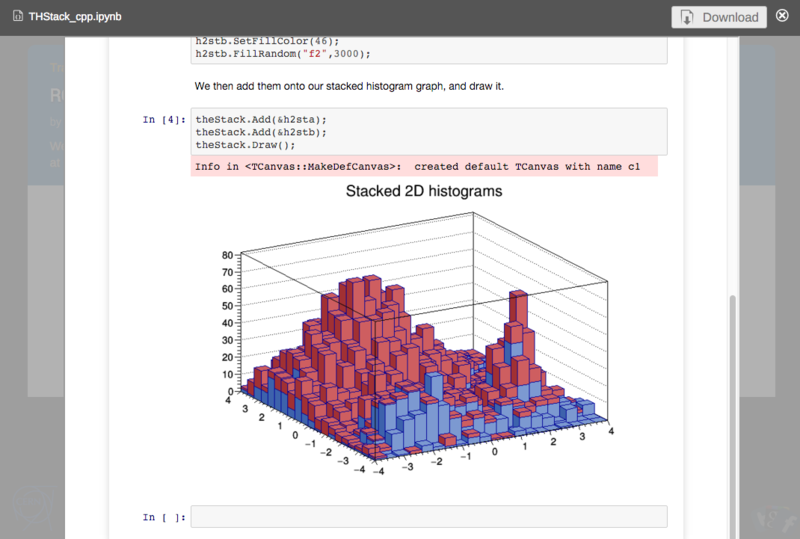 We're happy to announce that Indico now supports the rendering of Jupyter Notebooks (formerly known as IPython Notebooks). We believe this to be yet another important step in making Indico event more useful to our community. Otherwise, feel free to upload an *.ipynb file and try it out by yourself! Indico was conceived as the Swiss Army Knife of event organizers. Since 2004, we have contributed to the success of thousands of conferences and workshops around the world. In recent years, we have expanded our feature set, never forgetting Indico’s initial goal: to simplify basic operations in event organization and to make life easier for both organizers and participants. A proof of this commitment with the organization of small and larger events alike is this new release that we have prepared for our users. It targets mostly the Registration Form feature, which until now was a exclusive feature of conference events. The first big change is that Registration Forms are no longer exclusive to conference events. We have seen far too many cases of people wanting to couple the simplicity of a meeting layout with the flexibility of Indico’s registration form. We will keep moving in this direction, allowing people to use different configurations of building blocks. 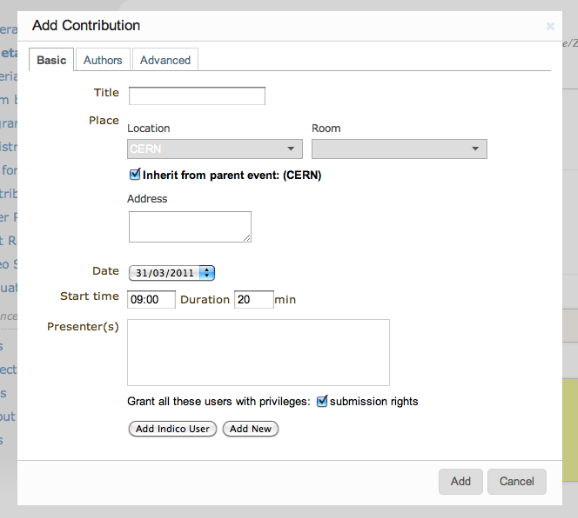 Although enabled by default in conferences and meetings, the registration feature can be used in lectures as well, if enabled from the Features dialog (Advanced Options). You will notice that the same is true for the Payment module, which we will mention below. 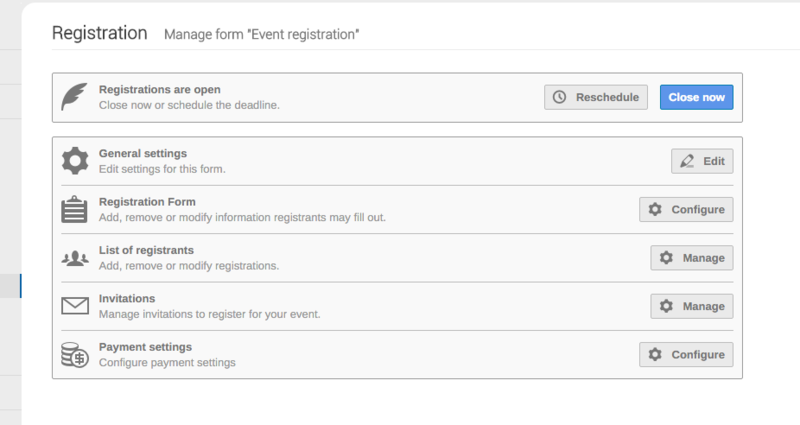 You can also now have more than one registration form per event. This especially useful if you require different information from different kinds of participants. The equivalent of the Registration process in Indico meetings was, until now, the Participants feature, a lightweight equivalent that supported slightly different workflows. Over the years, we’ve realized that most features in both systems were actually complementary. This is why this new release includes a single, more complete registration workflow that aims at covering all use cases that were previously supported by two different modules. This is why Registration Forms now support an invitation-based workflow as well as moderation. We hope this will allow organizers to have better control over who takes part in their events. The old Registration Status feature helped organizers keep track of information that should not, in principle, be visible to users. It was just a simple list of tags, which was clearly not enough for the needs of some of our users. We’ve tried to solve this in a flexible and simple way: you can now create Administrative Sections, parts of the Registration Form that are not user visible but that can be set up with the same degree of flexibility. Multi-option fields are now even more powerful. You can allow users to specify “+1” slots (useful for guests) and optionally charge them for it. By default, you will now only see a “Personal Data” section, containing no more than title, first and last name, e-mail, affiliation, address and phone number. All fields, with the exception of first/last name and e-mail, can be disabled. 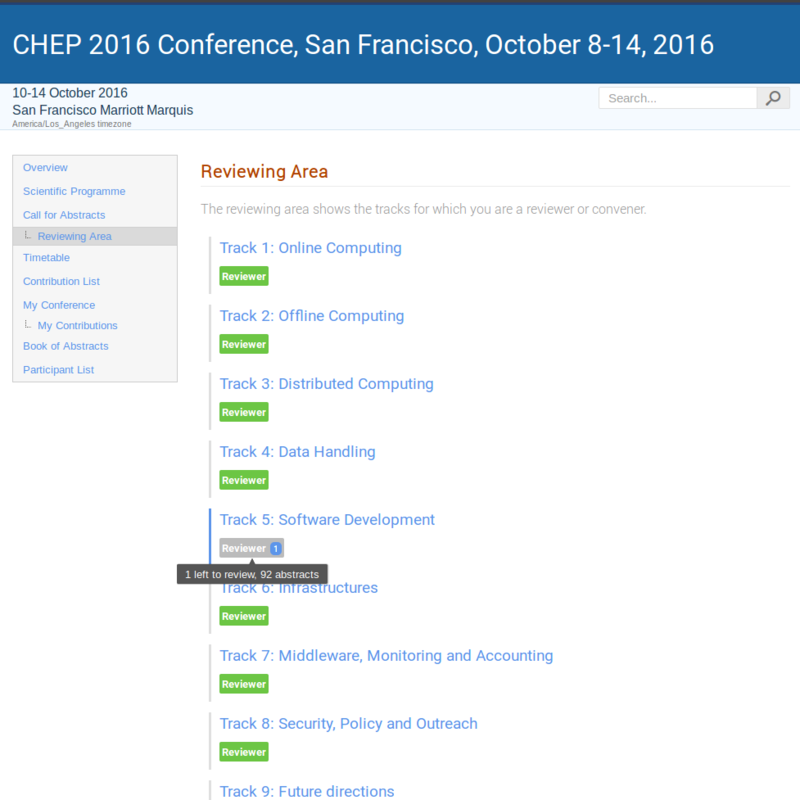 That’s the bare minimum conference organizers need and any other fields/sections you need can be easily added. Managing events with hundreds (or thousands) of participants is not easy, and we’ve been gradually trying to improve the performance and user experience of Indico in a way that larger volumes of participants are easier to manage. There’s certainly a lot of work to be done in that direction, but we’ve taken yet another important step: the List of Registrants is now faster than ever and includes a powerful filtering system that merges the old Apply filters and Columns to display functionalities. We’ve been gradually trying to “tidy up” our menus. In the last release, you’ve already seen them reorganized. This time, we decided we would permanently move options that concern the event as a whole (Lock, Clone and Delete) to the Event actions bar. Lock and Clone were already there, but Delete has now joined them as well. They have also been removed from the Tools/Utilities page. Since Delete is now easier to access, we’ve also made sure that the probability that people would accidentally delete any content (despite all the warnings) would be minimal. You will have to explicitly toggle a check box if you really want to do so. It’s been quite a long list of changes, but all of them have the sole purpose of making things simpler and easier to understand. We’re confident that this new release has succeeded in doing that, and we hope it will serve as a model for the next steps in this pathway to Indico 2.0. As usual, we are looking forward to your feedback! Thanks for your time! We're proud to announce a new update of Indico! We have worked hard to simplify some advanced feature that are nonetheless very important for our user community. First of all, there is a new way to activate and deactivate Indico features. 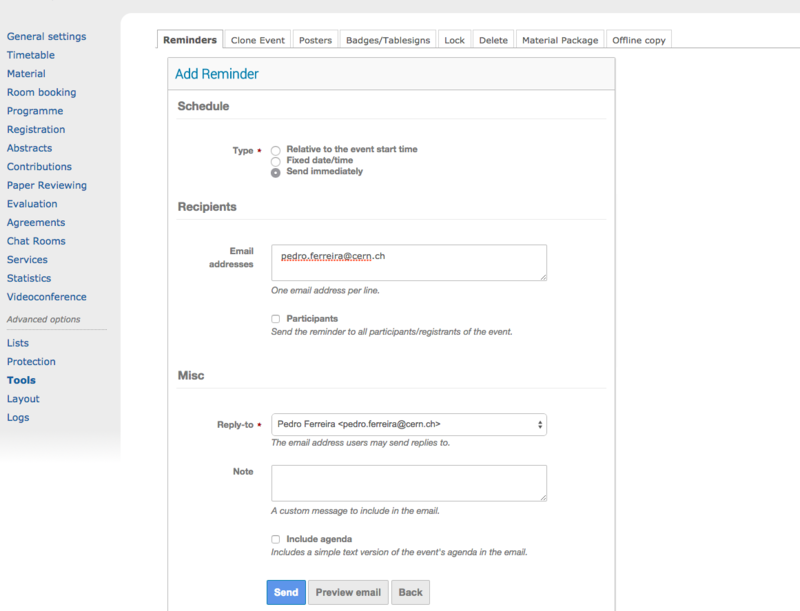 The new feature selector will simplify event management and leave complexity to power users. In the future, most Indico advanced features will be toggled in this way. For now, only a couple of them (Surveys and the Image Editor) can be managed. 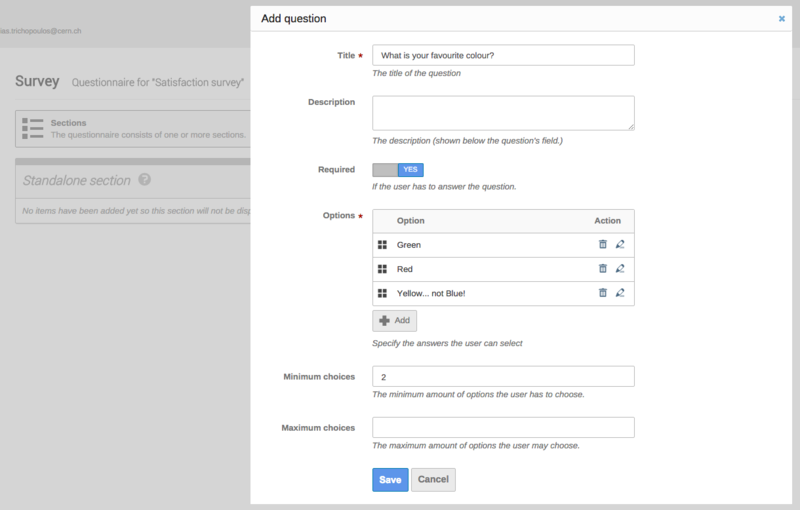 The most important change in this release is a completely new version of the Survey feature (formely known as "Evaluation"). 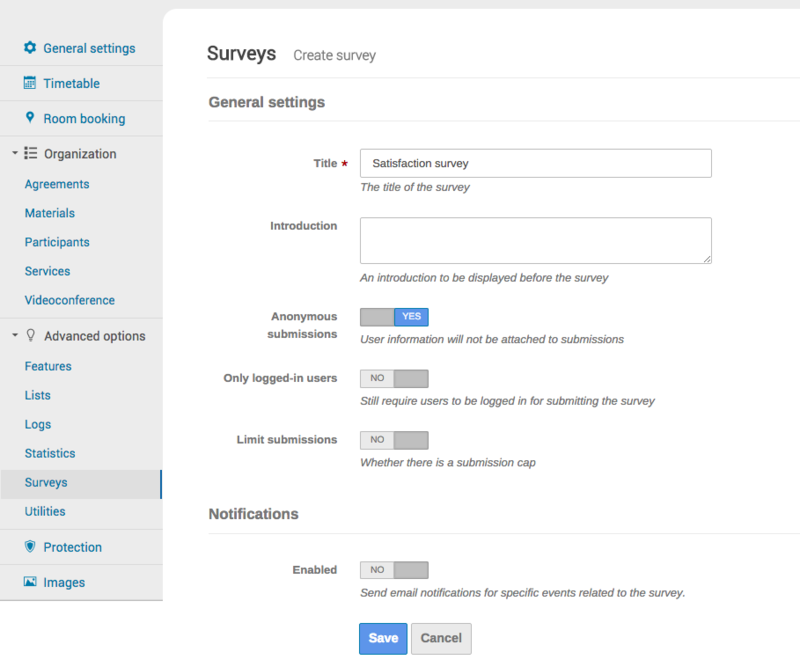 Many new things were added, such as the possibility of having more than one survey per event, support for "sections" and a drag and drop interface. Conference organizers will be happy to know we have also added drag and drop support for the menu editor. 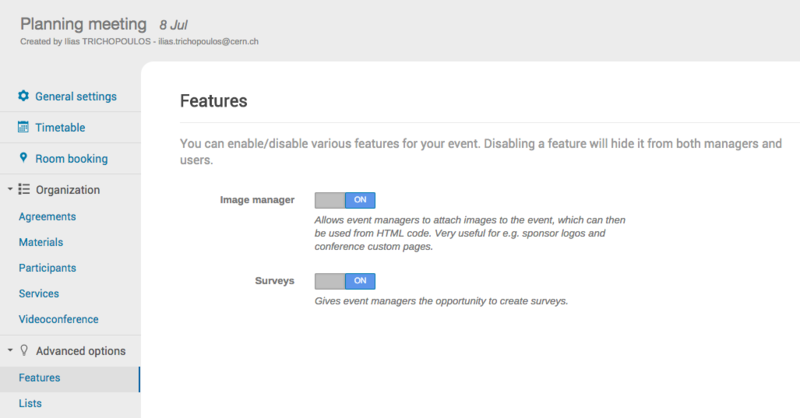 The layout settings of conferences are also now much simpler to work with. 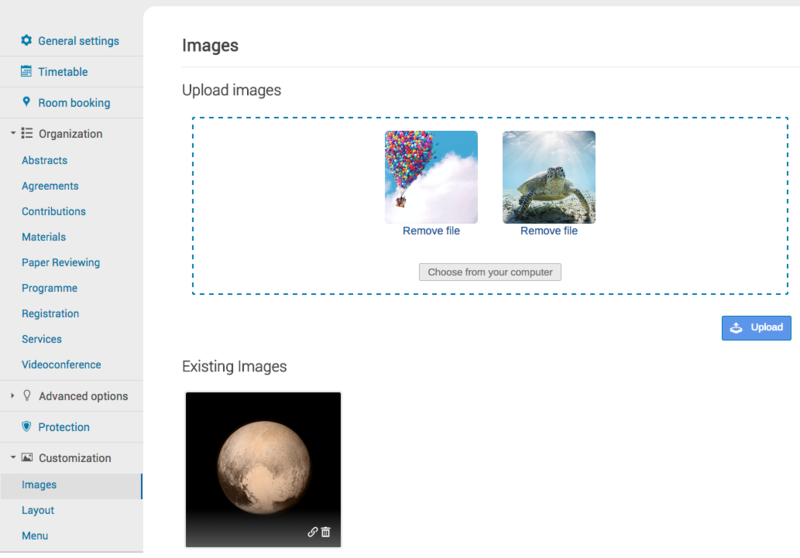 The "Image manager" has also been reworked. Dragging and dropping of image files is now supported, in the same way that it is already possible for materials. 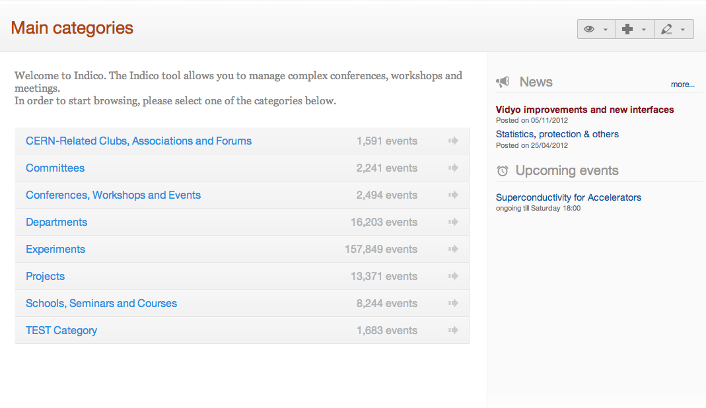 Another new interface that the conference managers will enjoy is the event layout management page. Adding a conference logo, editting the colours of the conference page and the rest of the existing features have now been polished with a brand new design. As you may have noticed in the above images, several pages in Indico, such as the event management page, room booking as well as the category management page, have received a new menu layout, grouping menu items together based on their type, for a better and easier navigation. We hope you will like this new release. We will be back soon with new things! After careful consideration, we have decided to make previewing of PDFs from within Indico optional and disabled by default. This decision was taken after collecting all user feedback provided over the last few weeks. From now on, users who prefer to directly download materials can continue doing so just like before. No configuration change is needed. The previewer will still be used for images, plain text and markdown files. And if you would like to use the previewer also for PDF files, you can still do so. Open your user profile, click on "preferences" and then toggle "Use previewer for PDF files". Please note that, even if you have the previewer enabled, you can still directly download files, using either the middle mouse button, CTRL + click or ⌘ + click (on OSX). We are proud to present you our latest creation: the material previewer. This new feature allows you to quickly see the contents of a file that is stored in Indico without having to leave your browser. Just click on it, as you would do in order to download it. You can still download files just like before, using the "Download" button. Currently, the most popular image formats, PDF, markdown and plain text files are supported. We will be soon introducing support for new formats. Stay tuned! Changes in "materials" and "minutes"
We are constantly reworking Indico, trying to make sure that event management is as easy and straightforward as possible. One of the points which we felt that could be improved was the management of materials - in the modern web, file management has to be simple and require as few clicks and dialogs as possible. We feel that Indico offers a very powerful material management interface, but one that could be easier for inexperienced users to understand - we decided then to work on its user-friendliness. One of the things that people learning how to use Indico used to struggle with was the concept of “Materials” vs. “Resources”. Materials were basically “types” of resources. We’ve always felt that this was confusing and not very user-oriented. This is why in the new Indico version materials and resources are one and the same thing: they are files that can be attached to events, contributions and other Indico structures. Do you still need to group resources together? You can use a “folder”. A “folder” is just a container for files/links. By the way, don’t worry about your old materials - they have been automatically transformed into folders. The material list has a new look. This should make things much easier to manage. The old upload dialog offered a lot of functionality, which used to confuse users. We didn’t get rid of this functionality - you can still fine-tune things using the “edit” feature. However, we’ve decided to keep the dialog as minimalistic as possible. The “drag and drop” area is one of the things we are the most proud of. You can just drag files from your computer into it and it will just work. You can still do it the old way, by clicking “Choose from your computer”. You can also upload a file into a folder if you want. The “Protected” switch lets you quickly specify whether other users should be able to open the file or not. By default, the protection level from the event/contribution/session will be inherited, but you can turn “Protected” on and restrict this further. You certainly remember that minutes used to be materials like anything else. Not any more. We now store minutes separately from event materials, which not only solves a series of technical issues but makes things easier to understand. Minutes can also now be consulted in-line in any event, and easily edited and downloaded. Materials are also now displayed in a nicer way, already taking into account the changes mentioned above. Alarms are now called "Reminders". We have re-organized the management interface. We hope you'll like it! A new version of Indico is now in production at CERN and with it many improvements. As it has been the case this year, most of the changes are happening in Indico's backend and aim at moving to a new and better performing data store. However, as it has already happened in the past, we are deploying some nice interface improvements which we hope that will make your life easier and the application simpler to use. 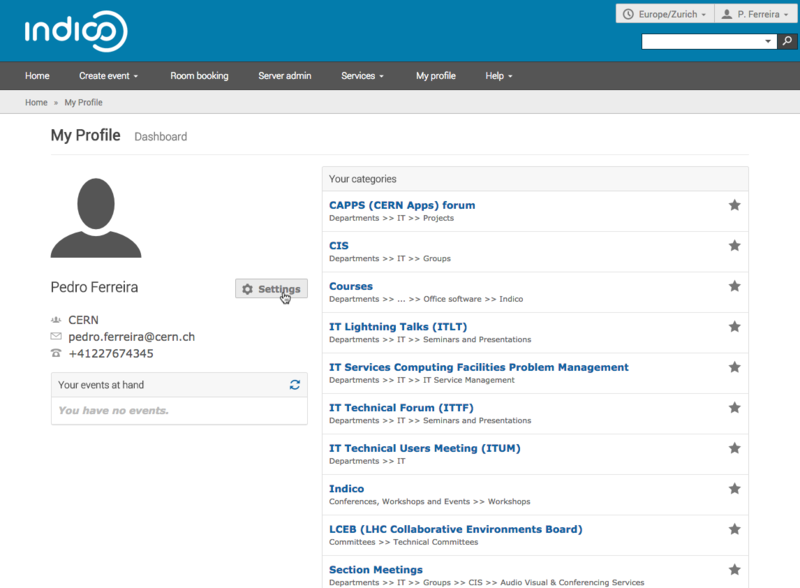 It is with great pleasure that we present the new user profile page, which now includes the user dashboard. 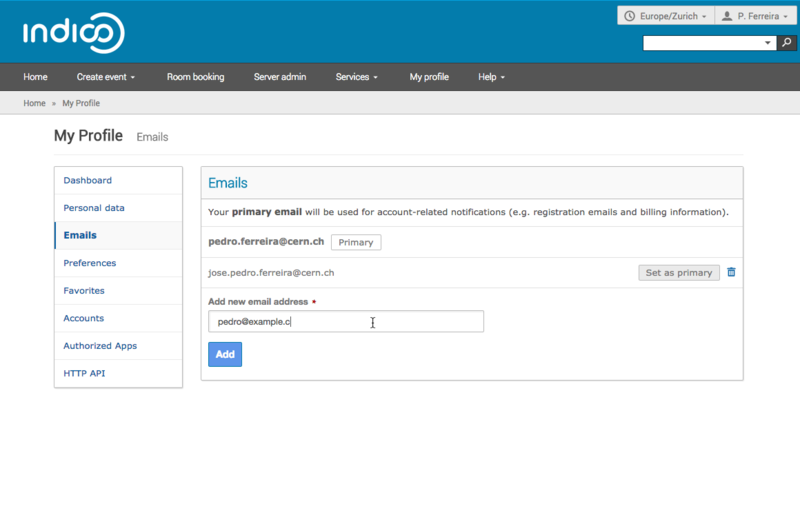 Managing your e-mail addresses is not much simpler. Just choose which one you want to keep as primary. As announced by e-mail on the 15th of July to all affected event holders, events in the Test Category that are older than 6 months are being periodically deleted. This measure aims to reduce the resources that are spent in storing old unused events as well as discouraging users from using the category for real events that should be instead placed somewhere else. The policy is already officially in effect since two weeks, but only now these events are being actively removed. We expect that in a couple of days all events older than 6 months will have been deleted. As you may have noticed, some things have change in Indico, mostly in terms of interface aesthetics. Over the last few years, we have been gradually introducing small interface improvements. Step by step, we are creating a more modern Indico, with a friendlier look and feel. This new logo is only the first step - it's fresher and smoother, but doesn't break with its predecessor. We hope that you will agree! Those who are using our HTTP API, namely the Room Booking part, may want to have a look at the list of changes. You may have noticed that the Room Booking interface is much more responsive and response times are lower. This is because we are moving Indico to a more standard, better performant database system. For now, only this module has been affected, but others will follow over the coming months. Last November 2013 we have done a survey to collect feedback from our users, thank you all for your replies! In the following document we have summarized the results of the survey and we would like to share them with you: Indico survey results. This survey allowed us to collect many findings and ideas on how to improve Indico. We have already implemented some in the last releases and more changes will come in the future. Indico provides an HTTP API that allows anybody to export Indico data into many different formats. Up to now, an API Key was mandatory in order to query Indico's database, whether requesting public information or restricted content. 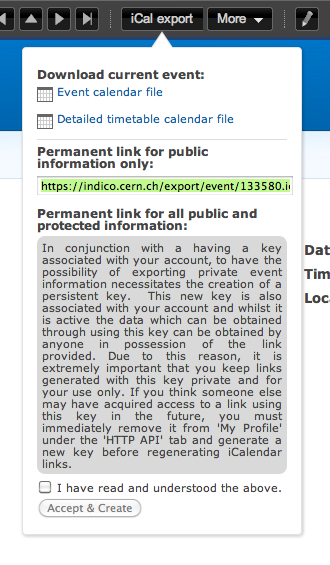 From now on, that API Key will not be required anymore to export data related to public events. On the other hand, it will still be mandatory when exporting restricted data, as well as the corresponding signature based on the user's secret key. Users do not need to apply any change to their scripts, everything will continue working as usual. We hope this change will make life easier for many of our API users, who need to fetch information from Indico and disseminate it through different media. 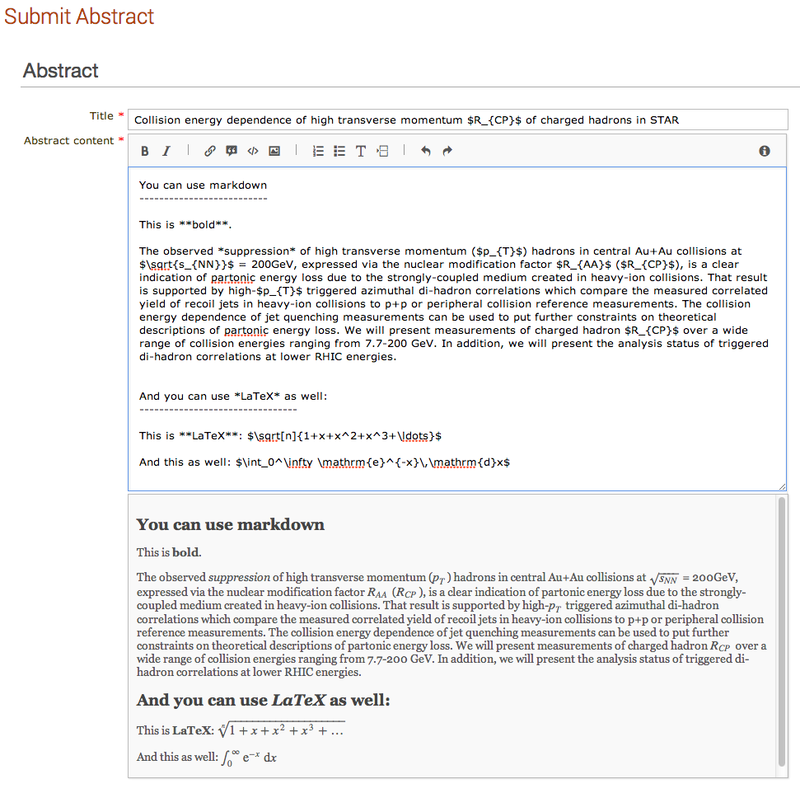 We are proud to present the new Abstract Form which provides content editors that support Markdown and LaTeX. 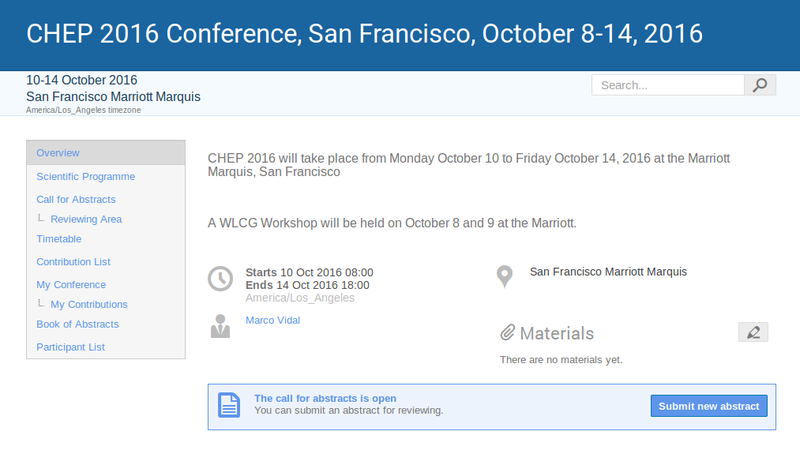 Authors will write their abstracts in Indico, including LaTeX formulas, and they will see a live preview in a panel just below the editor. Of course, all the PDFs generated by Indico will also render Markdown and LaTeX. The registration form is one of the most used modules but edition was not simple in the former versions of Indico. We have developed a very intuitive and simple interface to edit and create registration forms, simply using drag&drop and inline editing. Learn more from here. This new module will enable the generation of e-tickets for each participant of the event. Each e-ticket is a PDF with basic information and a QR code. This QR code can be scanned at the Registration Desk in order to check the participant in. How to scan that QR code? You can simply use our new mobile app Indico Check-in (download it from here). Learn more about this module from here. This old folk of Indico has come back to stay. It can be found in the tools section of every event and it provides the option to request an offline version of your event. This means that all organisers can download to their computer their events and navigate them offline. They can even browse the uploaded files without Internet Connection! Indico is trying to help you find the events that you might be interested in. 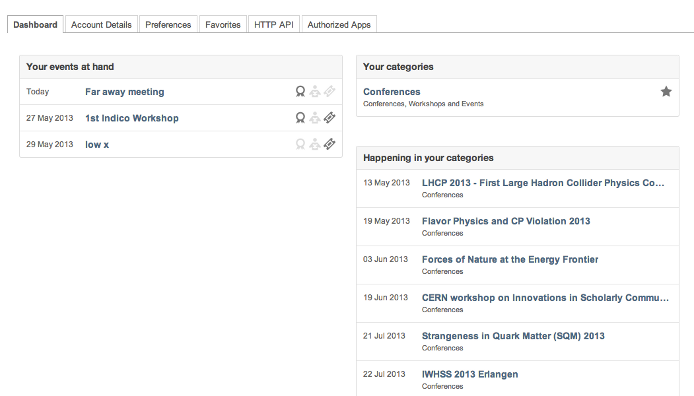 That is way that you will now see, in your Dashboard, a list of categories you might be interested in. If you find any of them interesting, add them to your favourites! Check it out right now from your dashboard. Vidyo Search: From now on, one does not need to create a new Vidyo Room for each meeting. You can simply search for your own Vidyo rooms and attach them to your event. Access and Moderator PINs: From now on, the acess and moderator PINs that one can define for a Vidyo Room are masked for security reasons and cannot be displayed on the event page. Moderators can always reset the defined PIN, but need themselves to distribute the PIN among the relevant participants. New URLs: take a quick look at your browser's URL bar. Indico URLs are now beautiful and short! 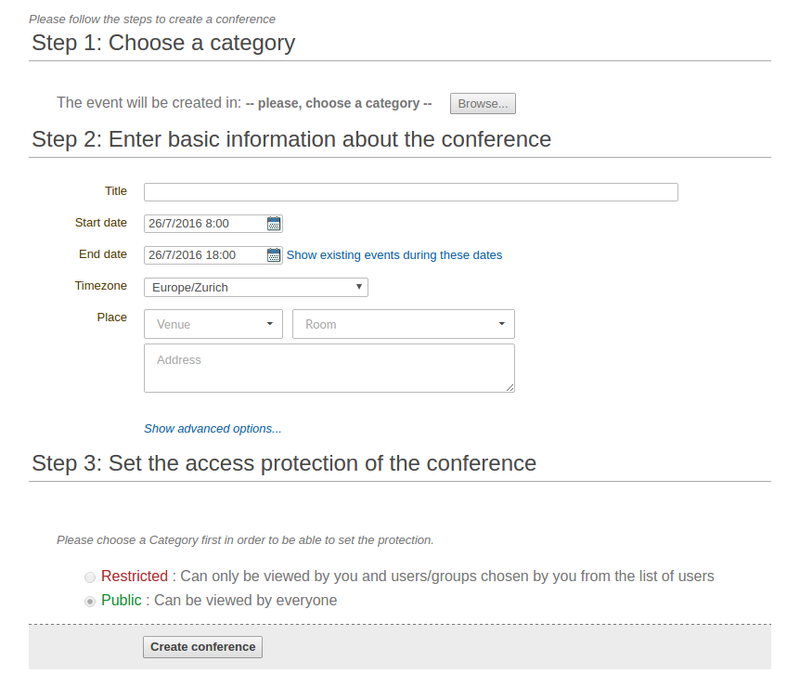 Extra configuration parameters can be found in the Conference/Layout/Menu/Timetable option. Conference organisers can choose if the timetable will be rendered by default using the regular or detailed view, and if it should use the normal or 'by room' layout. We have also added a new extra field type to the Abstract Form: dropdown menus can now be added to the form as an extra option. User search will ignore accents from now on. No more problems when searching for "González" since it will find the same results as "Gonzalez". We are proud to present the new mobile version of Indico. Now, whenever you connect to Indico from a mobile device, you will be able to choose whether you want to use the traditional interface or a simpler mobile-friendly version. The category browsing interface has now a much fresher look, and a layout that better adapts to tablets and other devices with smaller screens. 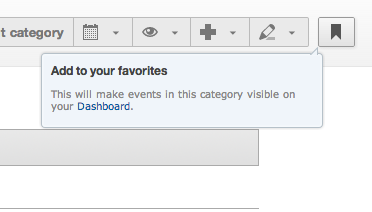 Now you can have "favorite categories" - categories that you want to follow. Just click on the button at the corner of the page, and the category in question will be added to your list. Then, from your Dashboard ("My profile" link in the blue bar), you will be able to see what is going on in your favorite categories. The Dashboard also allows you to know which events you are taking part in. Booking a room has never been easier. Based on the feedback we got from our users and standard usability practices, we have come up with an interface that is simpler and more efficient. 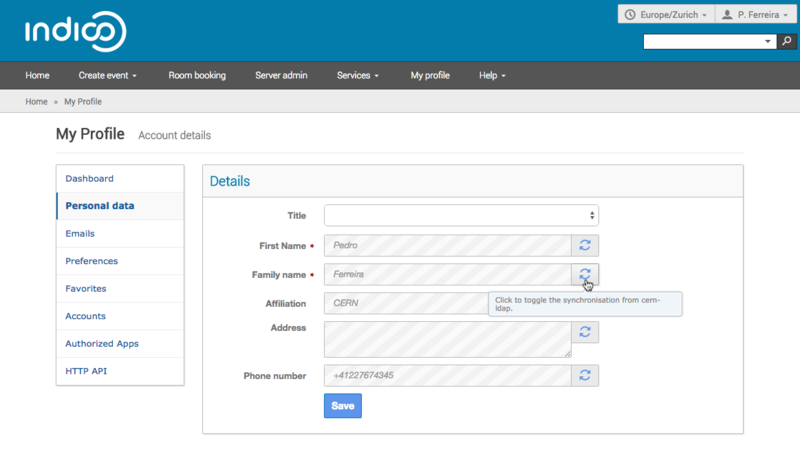 You can now search for rooms as you write and check the availability of more than one room at the same time. This is still a quite experimental interface, so, don't hesitate to send us your feedback on it. We have also thought about event managers in particular. One of the interfaces that had for a long time been waiting for improvement was the event log. 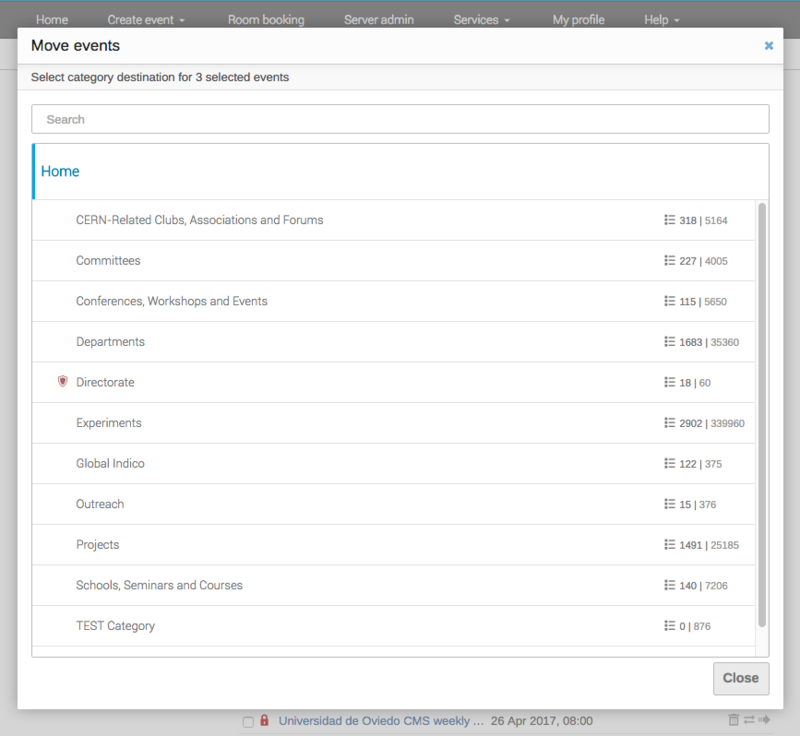 Now, if you click the "Logs" link from any event's management area, you will be shown a clean and functional interface that allows you to quickly get to know what has been happening with your event. 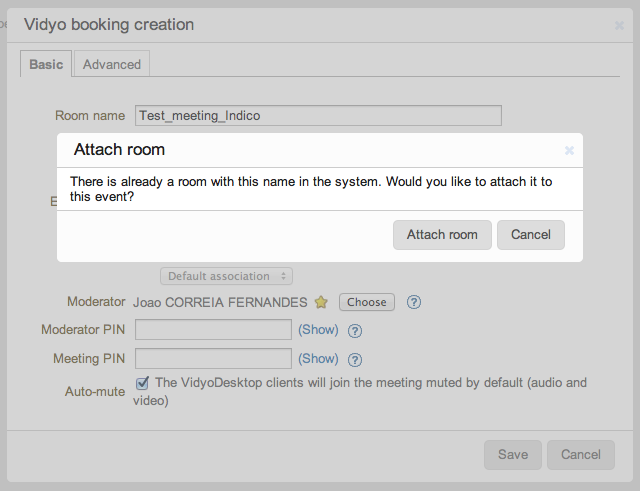 When creating a Vidyo booking, if the name of the Vidyo room does already exist and you own the room, Indico will suggest to attach the existing room to the event. From now on, vidyo services managers will be cloned when cloning an event (and Vidyo option is checked). A new feature has been added to the room booking service. One can define the daily availability of your room. For instance, you could set that your room can be booked and used only from 8h30 to 17h30. 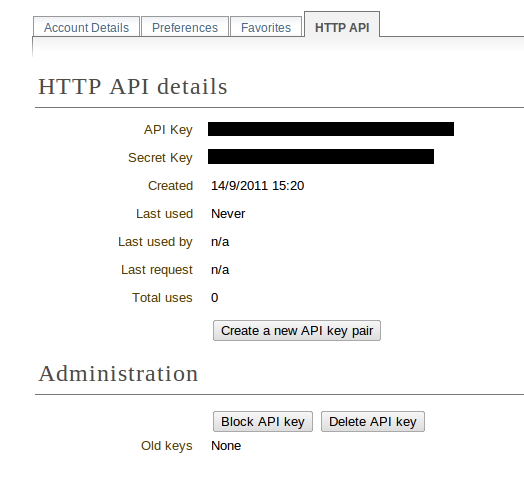 Third party applications can use our HTTP API in order to book a room. Now, Indico is syncronazing your participation in events with Outlook. When you are added as a participant in any event or when you register to a conference; an entry will show up in your personal Outlook calendar. Users can disable this option from its personal preferences. 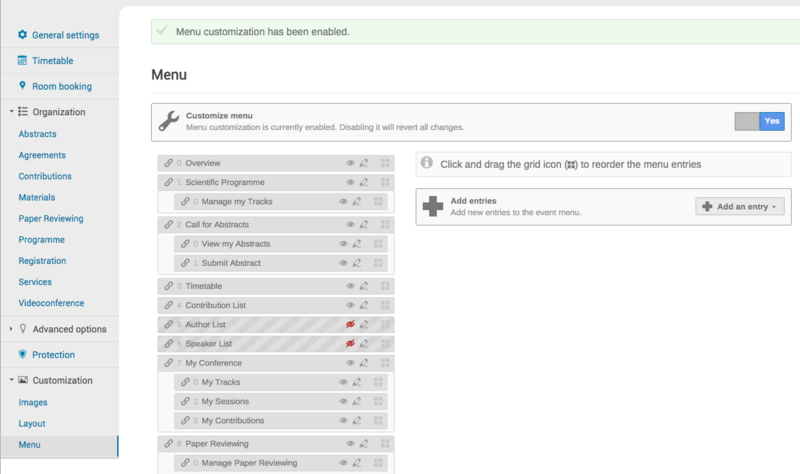 The modification of contributions is now done via a popup. 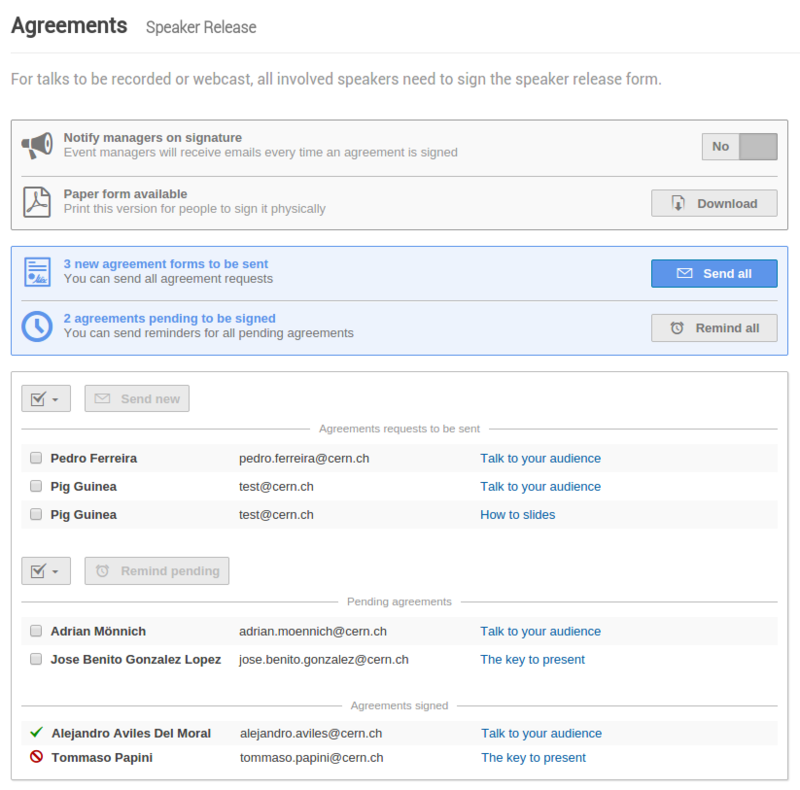 When adding or editing a contribution, we can grant/revoke the submission rights of the speakers individually. Conference overview: added icons and new style. Poster and Badges has been re-designed. Option List and Scientific programme for Conference organization. In the event protection page, warnings will be displayed if there are items inside it (contributions, sessions, materials) with a different protection. 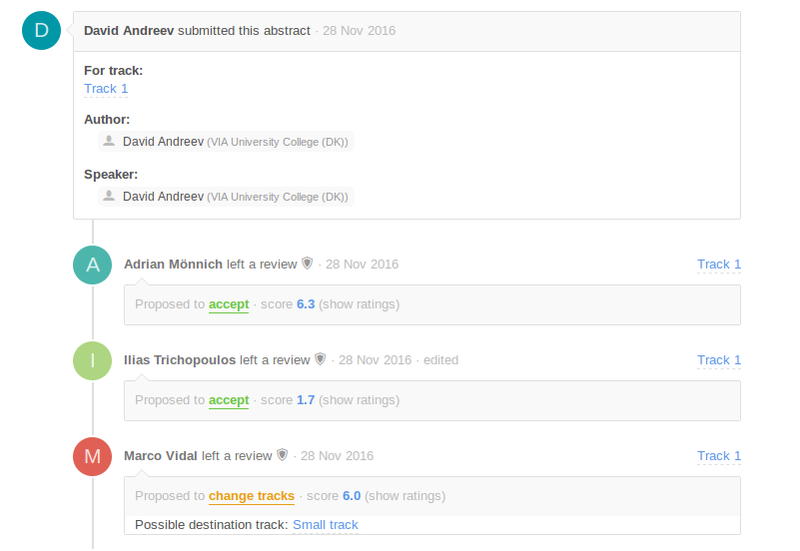 Added option to the setup page which enables track coordinators to directly accept or reject abstracts (before they could only propose). Added feature to change a rejected abstract back to 'submitted' status. Learn more here. 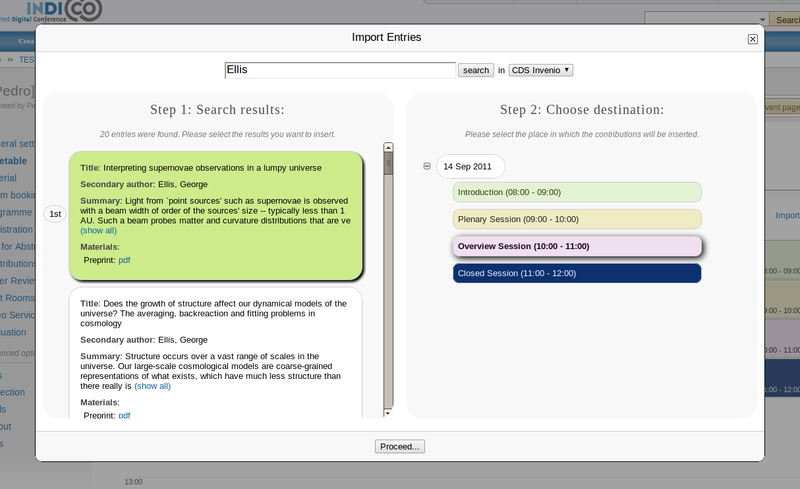 New layout for the list of abstracts, including a new tool bar and filters. As well, capabilities to sort by modification date and by track have been added. Added option to notify managers when a user applies for participation. Added the option to write, not only the email, but also the phone number. Search has been pluginized and added CERN Search. HTTP API: added action to download files. Indico software has been upgraded to its latest version. 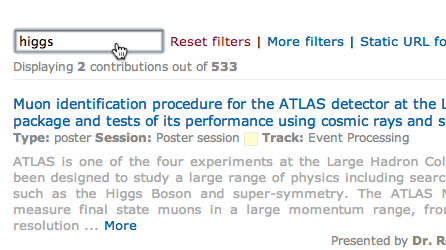 Statistics Per Conference & Contribution: a new widget has been added in order to track file downloading. added automute and moderator pin options. Learn more here. added "disconnect" button in order to stop on-going videoconference in a room. Learn more here. show 'connect vidyo room' always when accessing from the PC in the meeting room. Added more notifications on Paper Reviewing module. Learn more here. Reviewed and improved abstract status per track and global. Learn more here. Added a tool that allows to download all attached files. 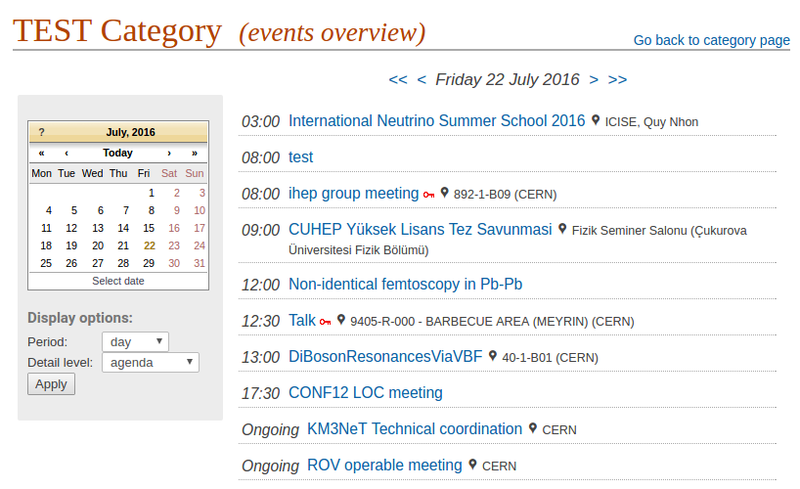 A new version of Indico is now available at CERN. Please note that our policy concerning iCal/Atom feeds has changed - before, downloaded iCal/RSS files included all events, even those protected (except for categories inside ATLAS). Now, users will only get back the events that they are authorized to access. If you want to have an iCal/Atom file that contains events that are private (and that you can access), you'll have to log in first. If you wish to retrieve this information without having to log in (i.e. 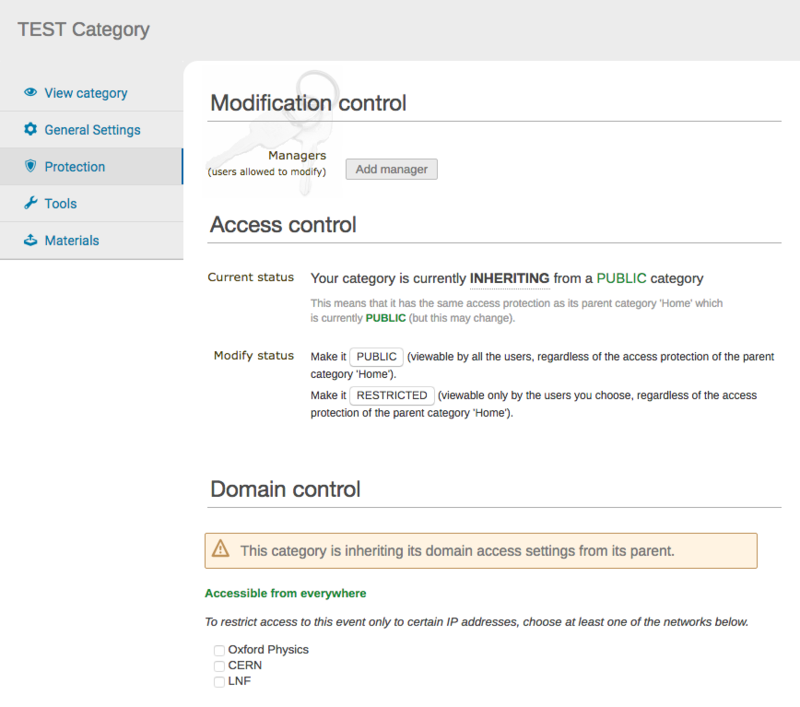 using an automatic system), consider using our HTTP API. Last summer we have done a survey to collect feedback from our users, thank you all for your replies! This survey, as well as a simple heuristic evaluation and usability lab test sessions done in parallel, allowed us to collect many findings and ideas on how to improve Indico. We have already implemented some in the last releases and more changes will come in the next few months. 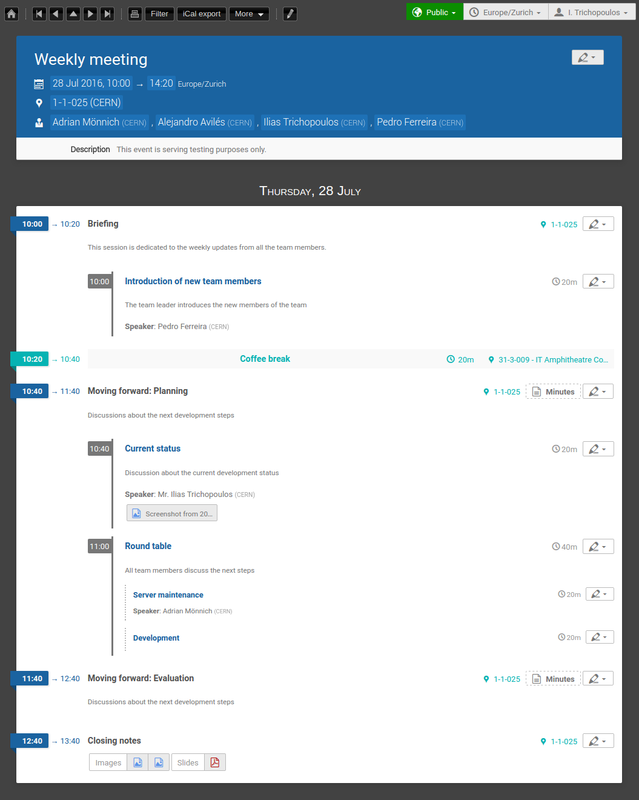 Timetable Drag&Drop: The edition of your event timetable is easier now. 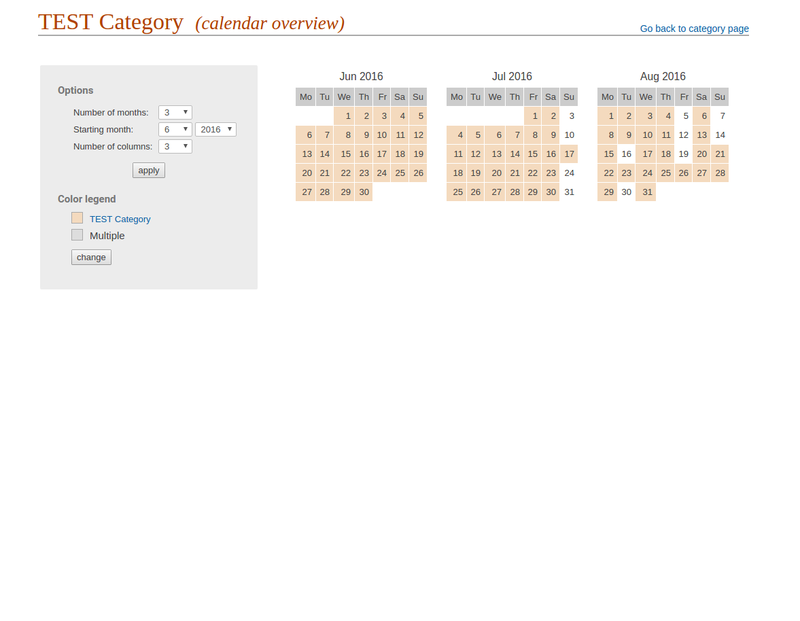 Simply, drag and drop the timetable entries in order to change their start date. 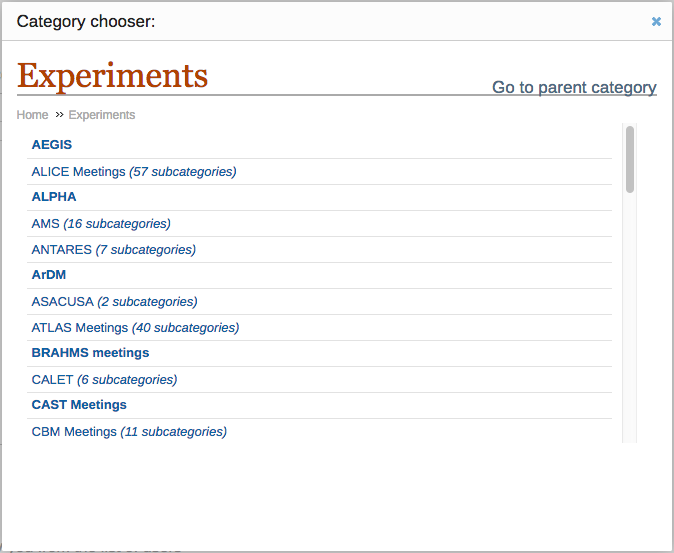 One can also resize the timetable entries, move contributions inside sessions and undo the last change. Learn more here. Renewed participant module: This module has been changed from the core to the interface. It is easier to use and setup. You can also customize all the e-mails. Learn more here. 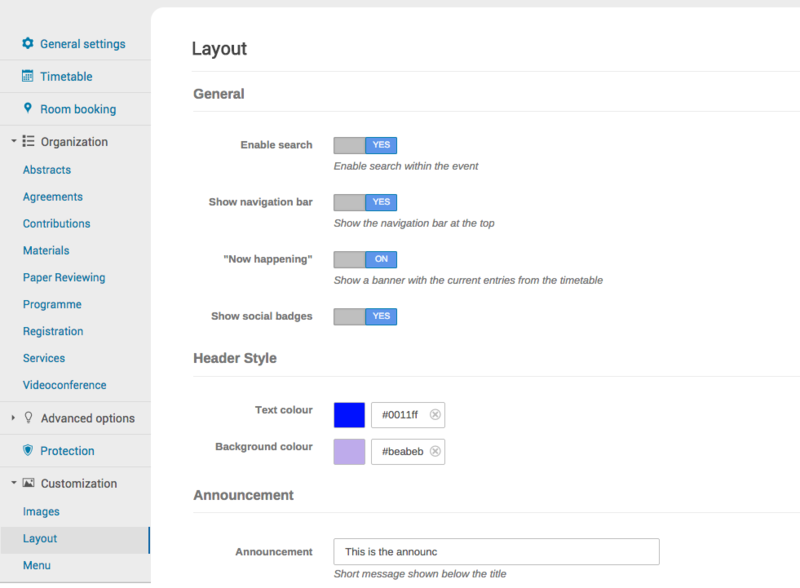 User search: All modules that provide a search for users are now opening a fast search pop-up with "favourites" capabilities. New pop-up dialogs: All Indico pop-up dialogs have been improved in order to perform better with all browsers. They can be dragged around the webpage and they can be closed using ESC key. Faster room booking: The performance of the room booking system has been improved, particularly: Calendar, My rooms, Bookings in my rooms, Pre-Booking in my rooms, My bookings, My pre-bookings, Blockings in my rooms. Synchronize Indico with your calendar: Now you can generate a link to use it from your calendaring tool in order to synchronize it with Indico. 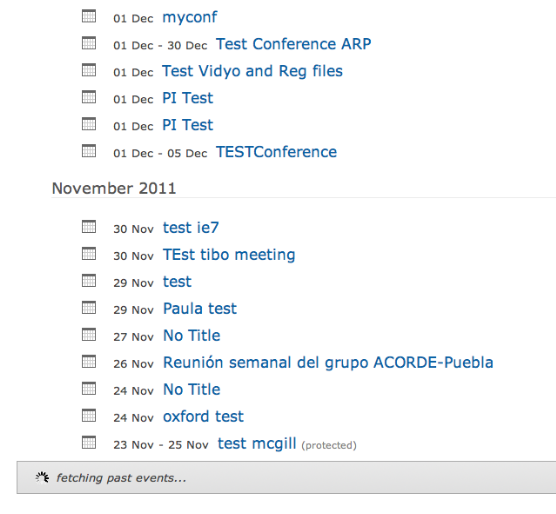 Faster loading of events: Thanks to an "infinite scroll" implementation, it is faster to access a long list of events. Indico is loading for you the next events in the list before you scroll down to the last entry. In line with the growing adoption of social networks by our users, we have introduced a new feature that allows Indico users to share Indico events using different social web sites. When triggered it opens a pop-up which allows the content of the page to be immediately shared using any of the supported services. It is as well possible to directly import the event to Google calendar, just with a click. Please note that the event data in Google Calendar won't be updated in case it changes. If you want that to happen, you should manually import the event's iCal file into Google Calendar. Stopping export.py. Move to HTTP API now! 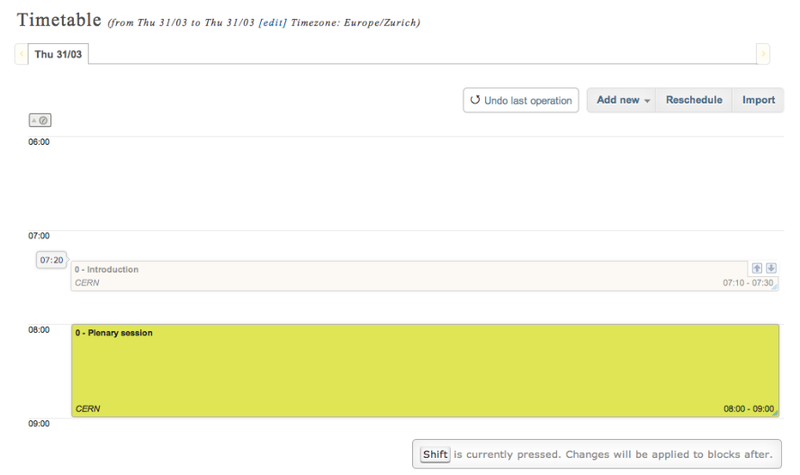 The 4th of November, the old export interface will be discontinued and shut down, in favor of the new HTTP API. Please, change your scripts, cronjobs, etc, to comply with the HTTP API as soon as possible and before the 4th of November, when export.py will not be available anymore. HTTP Export API: Indico allows you to programmatically access the content of its database by exposing various information like category contents, events, room and room bookings through a web service. You can also access protected information using an access control service. Learn more here. E-payment extra fee: Conference organisers can setup extra fees for credit card payments. 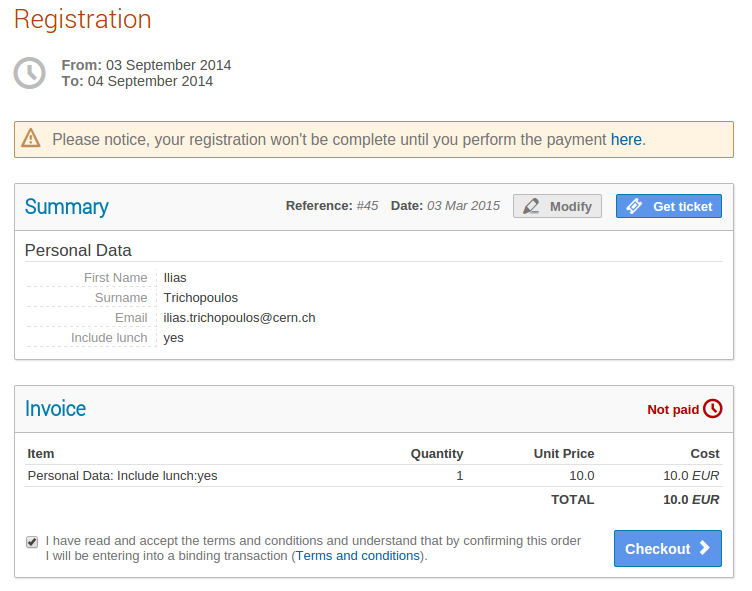 For instance, one can choose to charge extra 4 CHF with VISA, MasterCard, etc. 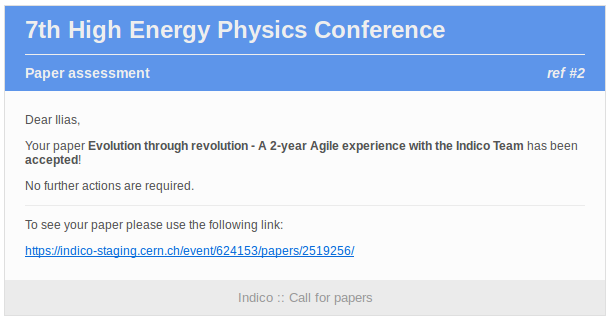 Check it out in your conference, Registration > E-payment > CERN E-payment. Electronic agreement: when requesting a webcast or recording for your event, there is no need for authors to sign a paper agreement anymore. Now this is done electronically throug Indico. Learn more here. Contact info: Category managers owning protected categories can set contact details to be used in case of an Access Error. In such a case, a user that cannot access (and he should) will know who to contact. 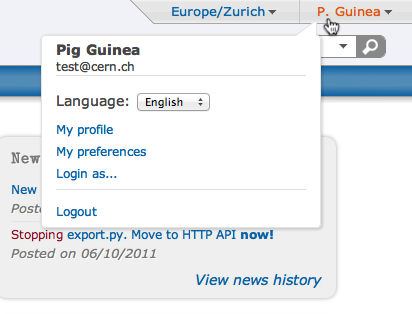 Automatic profile update: Your personal data is automatically updated with the information from CERN database. If you want to keep a different Indico profile you can now edit it and avoid the synchrozation. 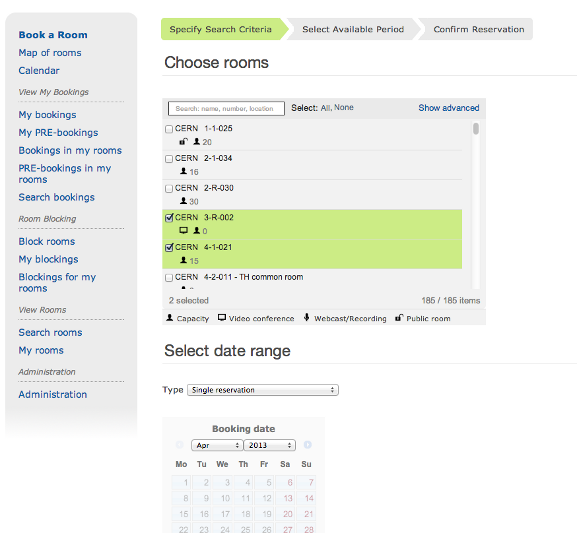 Map of rooms: The map of rooms has become the home page of the room booking system. Importer: Indico Timetable has a new feature Import. 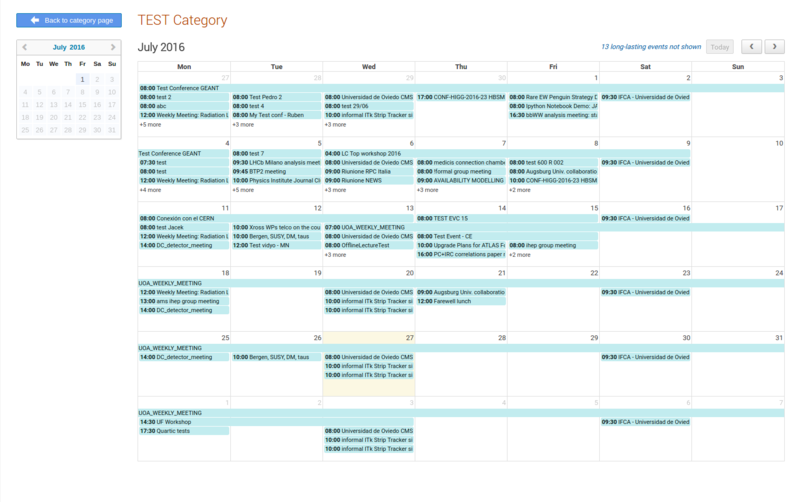 This tool can be used to fetch information from CDS and attach it to your event timetable. Learn more here. Room blocking: If you are a room manager and you need to prevent bookings during a given period for a set of rooms, this is your feature. 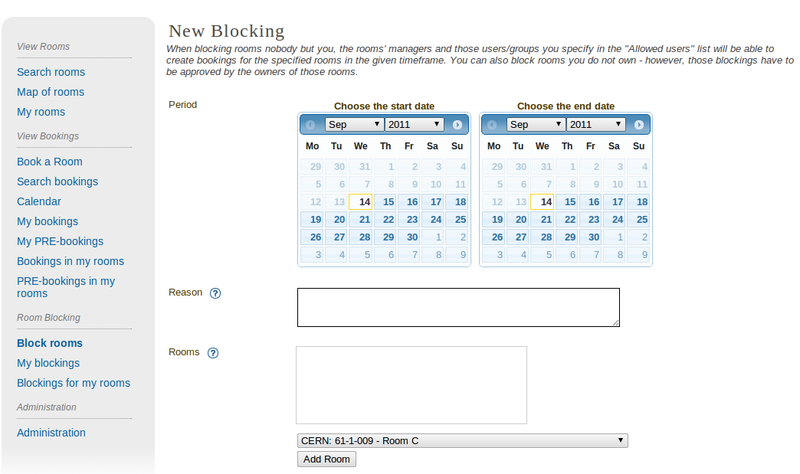 Block a room for any period of time and nobody but you will be able to create bookings. Learn more here. 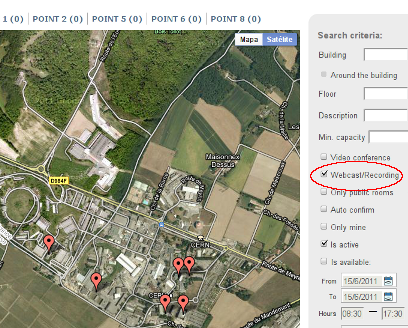 Now you can search for rooms with webcast and recording equipment directly from the map of rooms. Let us know what you think about Indico and how we can improve it. Please, take 5 minutes of your time to complete our survey, it is totally anonymous and your personal information will not be made available for any purpose. So, what are you waiting for ? Answer the survey now! Indico is now faster thanks to many performance optimizations, including event overview, timetable, abstract and contribution listing. Navigation itself is in general more prompt. Web chat integration: organizers chairing remote meetings can create a chat room for the attendees and a direct link to the room will be published in the home page of the event. Lear more from here. Paper reviewing module: full reviewing process for the papers have been integrated in this version 0.98. Learn more from here. Updated the search engine in order to provide a faster indexing of data and straightaway search results. Multi-file upload: now one can upload multiple files at the same time. 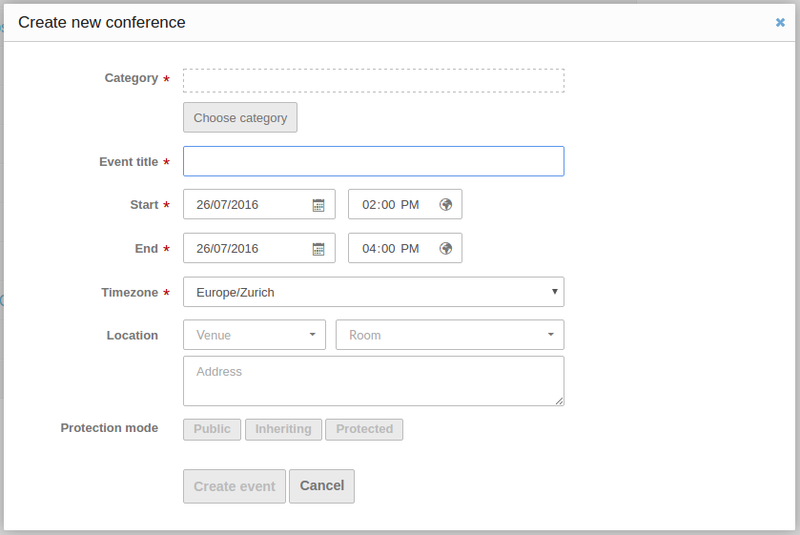 We’ve introduced user preferences, for instance, a user can choose if past events should be always displayed or not (default). Just check it in you profile page! Indico is now more secure: fully HTTPS after log in. All this actions are performed in less than 1 second (avg) after these improvements. We are proud to announce that new Video Services features are available for your conferences, meetings and lectures. 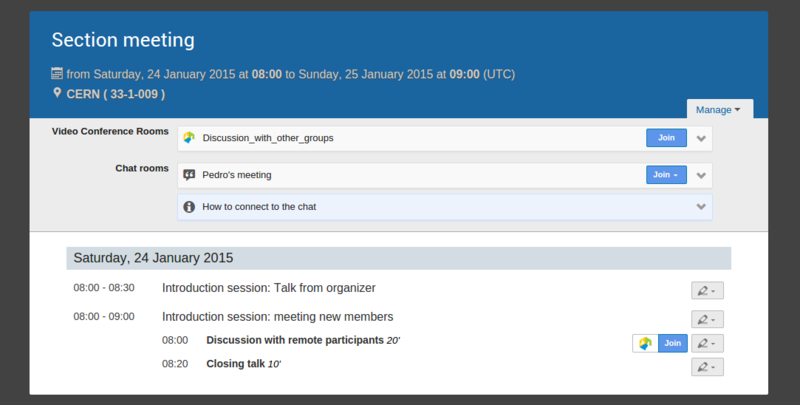 Indico users can now easily join videoconferences created by event managers in the EVO system or through CERN's MCU. Connection information will appear on the events' display pages. 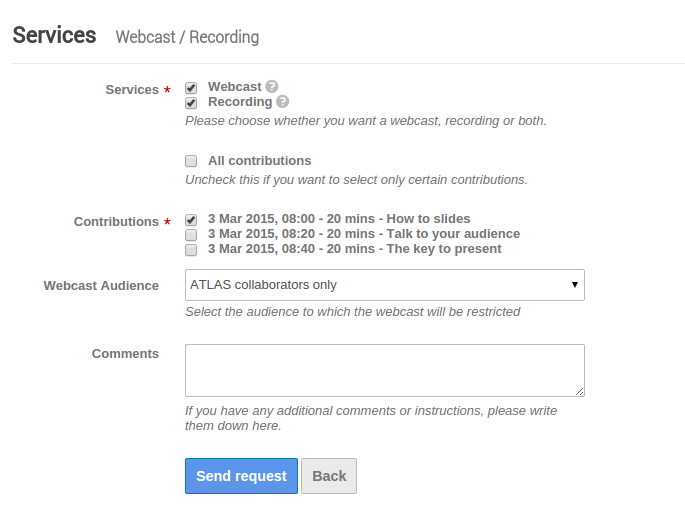 Request that their events be webcasted in equipped rooms. 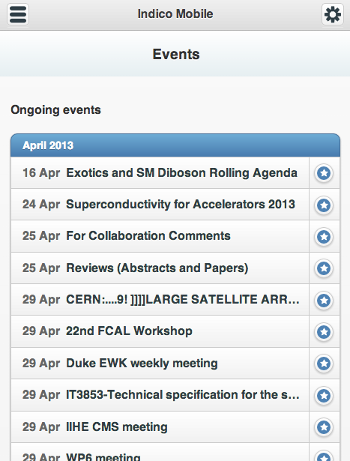 For more information on the EVO and CERN's MCU services, please visit the Videoconferencing technologies at CERN page. For more information on how to use the new Indico features, please consult the Video Services guides in the Help page. a completely reshaped interface for a greatly improved user experience. internationalised interface (currently in French and English). new popup widgets including a better date selection tool, minutes writing tool, user and group selection tool. entirely customizable conference web sites. 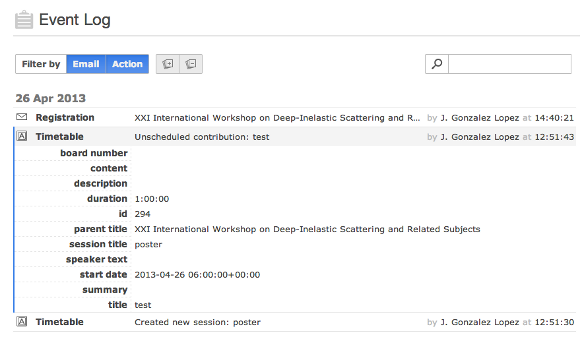 better handling of the conferences timetable. general performance improvements - This will be our main focus for the next semester. 27.03.2008 Indico v.0.96 in production. Indico is now timezone-aware! 30.06.2007 Indico is now load-balanced on 2 application servers - This should avoid further overloads like the recently experienced ones.